Stanford, Millen and Tchenguiz: victims or favoured clients? “In my opinion, it is quite wrong that a bank can pretend to have money and security which it doesn’t have, generate a false balance sheet and use its own customers to fund acquisition ambitions.” According to the Guardian, the fashion entrepreneur Karen Millen is pursuing a series of legal claims against the Kaupthing estate, together with her ex-husband Kevin Stanford (more on his Icelandic contacts). Millen is of the opinion that Kaupthing wasn’t entirely straight about its position. She might not be the only one to think so – but before it all went to painfully wrong, her ex-husband was indeed very close to the Kaupthing managers. It’s unclear how well informed Stanford kept his ex-wife on their business dealings. He was the financial motor in their cooperation, Millen the creative one. Millen and Stanford built up a fashion label, the Karen Millen name is still prominent on UK high streets. But the name no longer belongs to her. Millen has lost her name to Kaupthing. She is understandably upset but she isn’t the first designer to lose her/his name to the bankers by being careless about the small print. After the collapse, some of Kaupthing’s favoured clients have claimed they were victims of Kaupthing’s managers who did not inform them of the bank’s real standing. Karen Millen is the latest to complain of Kaupthing misleading her. She is, understandably, outraged at not being able to use her name for her label. A clever lawyer would have made sure it couldn’t happen. Stanford was evidently very close to the Kaupthing managers, which might have lulled him into the false believe that he didn’t need to be too careful about the wording of the contracts. How close was Stanford to Kaupthing? Just before the collapse he was the bank’s fourth biggest shareholder and among the largest borrowers – the familiar correlation between large shareholding and huge loans in the Icelandic banks. What was this enormous business that Stanford was running that merited loans of €519m? Pay attention here. Stanford introduced “family and related clients.” – Did he, as sometimes happens, get paid for the introduction? – And then this, that some of this was “silent participation” of his ex-wife and vice versa. Did she have a full insight into how her name was used by her husband? Noticeably, he was the second biggest private borrower in Kaupthing Luxembourg, where all the dodgiest loans were issued. Stanford’s Icelandic connections are on the whole quite intriguing. He wasn’t only closely connected to Kaupthing but also to Glitnir, at least after Jon Asgeir Johannesson, with ia Hannes Smarason and Palmi Haraldsson, became the bank’s largest shareholder in summer 2007. When Glitnir financed a clever dividend scheme in Byr, the building society, Millen suddenly appeared as one of the stakeholders in Byr. Was that because she was so keen to invest in an Icelandic building society? Some of Stanford’s fashion businesses were joint ventures with Johannesson and his company, Baugur. This scheme doesn’t seem to have hit Stanford and Millen with losses in spite of a loan of €41m to this entreprise. Last year, Stanford wrote a letter to the Kaupthing Singer & Friedlander estate to substantiate his claim that he should not pay back KSF £130m he had borrowed to buy Kaupthing shares. According to his understanding, this lending was part of Kaupthing’s support scheme, in other words (which Stanford didn’t use) ‘market manipulation.’ – Stanford is and wants to be taken seriously as a business man. Didn’t he see anything strange in the fact that a bank was lending him money, with no risk for Stanford, to buy its own shares, with (if the scheme was the usual one) nothing but the shares as a collateral? Stanford says that after talking to former Kaupthing Singer & Friedlander staff he now understands that the Kaupthing Edge deposits were used to buy ‘crap’ assets from Kaupthing Iceland, which lent the money on to Kaupthing Luxembourg that then had the money to lend to high net worth clients like Stanford. This scheme, according to Stanford, enabled senior Kaupthing managers to sell their Kaupthing shares. This is an interesting description of the use of the Kaupthing Edge deposits, which (contrary to Landsbanki’s Icesave) were in a UK subsidiary and consequently guaranteed by the UK deposit guarantee scheme. * Stanford is right that the money was lent to high net worth clients – but not just to any clients: it was lent to the favoured clients who got the conventant-light loans. Kaupthing senior managers may have sold some of their shares but they did by far not sell out – it would have caused too much of attention and undermined trust in the bank. Other big Kaupthing clients, like Vincent and Robert Tchenguiz, have also complained of being the victims of Kaupthing’s market manipulation. All these people are – or have been – locked in lawsuits with Kaupthing. The claims to the media is part of their PR strategy. Being duped by Kaupthing means someone did the duping, allegedly the managers of the bank. Yet, none of these ‘ill-treated’ is suing any of the managers. They are suing the failed bank’s estate. That’s logical because the estate has assets. But it also raises the question if the strong bonds, which clearly connected the Kaupthing senior managers and their major clients, have survived the collapse and the consequent losses. It’s also worth noticing that in spite of enormous loans that the favoured clients got, they have, like Stanford and the Tchenguiz brothers, proved remarkably resilient to losses. That may be due to luck, business acumen or both – but a part of it might also be the convenant- and collateral-light loans that Kaupthing did, after all, bestow on them. Which is part of the Kaupthing-related cases that both the Serious Fraud Office and the OSP are investigating. This way of banking runs against all business logic. The question is what sort of logic it followed. *The fact that Kaupthing Edge was guaranteed by the UK deposit guarantee seems to be one of the motives for the SFO investigation. I find it incomprehensible that SFO isn’t investigating Landsbanki’s Icesave, which the UK Government did bail out – hence the Icesave dispute. At the height of the banking crisis in 2008, Qatari investors stepped in to invest in two European banks – Barclays and Kaupthing. Later, these investments were and are the focus of criminal charges, not against the investors but the bankers, who orchestrated the investments. Both cases show that the Qatari investors were intent on profiting not only from the investments but also from hidden fees and sham arrangements. “A sham agreement requires two parties;” if the defendants were dishonest, so were the other party, the Qatari investors,” said Justice Jay during the Barclays trial recently. – This is not only relevant in connection to stories from 2008 but raises impertinent questions regarding Qatari investments in Deutsche Bank and other banks. In autumn 2008, many Western banks were forced to seek emergency loans from governments. Three banks – Barclays, Deutsche Bank and Credit Suisse – were boastful of the fact that they did not need government funding. As has now become abundantly clear, all three tapped heavily into US measures to save US banks and foreign banks operating in the US. Even more to brag about was the fact that Barclays and Credit Suisse were able to raise funds in the market: Qatari investors were crucial in saving the two banks. Admittedly investment at a high price but these were singularly difficult times. The Barclays investors were two Royal Qataris. Sheikh Hamad bin Jassim bin Jabr Al Thani, at the time Qatari’s prime minister, also known by his initials, HBJ. In 2013, The Independent dubbed him “the man who bought London” where he has invested both through his private companies and Qatar Investment Authority, QIA. His co-investor was Sheikh Mohammed Bin Khalifa Al Thani who in 2008 also invested in Kaupthing. Barclays paid them £66m for bringing along Sheikh Mansour Bin Zayed al Nahyan, well known in the UK for high octane investments such as Manchester City Football Club, another 2008 investment of his. The Barclays Qatar story took a different turn in 2012 when the Serious Fraud Office, SFO, opened a criminal investigation into the Barclays deal with the Qataris: the price for the investment was even higher than previously disclosed as Barclays had kept quiet about two “Advisory Services Agreements.” On the basis of these agreements, Barclays paid the Qatari investors and Sheikh Mansour £322m; allegedly, no advice was given. The four Barclays bankers – Barclays CEO at-the-time John Varley and then-senior executives Roger Jenkins, Richard Boath and Tom Kalaris – who orchestrated the payments are now fighting criminal charges in court. Intriguingly, charges against Barclays PLC concerning a loan of $3bn to the Qatari investors were dismissed last year by the High Court. In Iceland, the Special Prosecutors has exposed another Qatari investment saga, at the core of a criminal case against three Kaupthing bankers and the bank’s second largest investor. It turned out that a Qatari investment in Kaupthing in September 2008 was entirely funded by Kaupthing. Sheikh Khalifa was not charged but charges brought against three Kaupthing bankers and Ólafur Ólafsson, the second largest shareholder at the time, all of them sentenced to lengthy prison sentences. Now, to the plights of Deutsche Bank. It survived 2008, much thanks to US funding but in 2014 Deutsche Bank was lacking capital; luckily, Sheikh Hamad bin Jassim bin Jabr Al Thani and Sheikh Mohammed Bin Khalifa Al Thani started investing in the bank, eventually becoming the bank’s largest investors. Now, as the German government hopes that a merger between two weak banks, Deutsche Bank and Commerzbank, might (contrary to evidence and experience) make a strong bank, the Qatari investors have indicated they might be ready to invest further. Intriguingly, two criminal cases regarding Qatari investments show hidden deals the banks did with the Qataris to meet their demands for benefits beyond what investors could normally expect. The question is if these hidden favours were only relevant for these two cases – or if they are general indications of Qatari investors’ preferences in doing deals. If so, it raises questions regarding other Qatari investments in European banks. After a tsunami of bad news in 2008, the one good news for Kaupthing came in September, miraculously a week after the collapse of Lehman Brothers: Sheikh Mohammed Bin Khalifa Al Thani, of the Qatari ruling family, had privately invested in Kaupthing. The investment amounted to 5.01%, just above the 5% threshold that triggered a notification to the Icelandic stock exchange, securing media attention. This investment made the Sheikh Kaupthing’s third largest investor and the only major foreign investor. In a statement, the Sheikh claimed he had followed Kaupthing closely for some time and was satisfied of its performance and good management team. Chairman of Kaupthing Sigurður Einarsson said at the time that the bank’s strategy to diversify the shareholder base was paying off. To Icelandic media Kaupthing’s CEO Hreiðar Már Sigurðsson said this showed investors had faith in the bank. But this investment was not enough to save the bank: in the second week of October 2008, Kaupthing collapsed, together with 90% of the Icelandic financial system. Only months later, rumours were circulating that the Qatari investment in Kaupthing had not been quite what it seemed to be. In April 2010, when the Icelandic Special Investigative Commission, SIC, published its report one of its many colourful stories recounted the reality behind this Qatari investment in Kaupthing: it had been entirely funded by Kaupthing and Sheikh Mohammed Bin Khalifa Al Thani had apparently only lent his name to this Kaupthing PR stunt. The go-between was Ólafur Ólafsson, Kaupthing’s second largest investor. The mechanism was that Kaupthing lent funds to an Icelandic company owned by the Sheikh. In addition, Kaupthing issued a loan of $50m, labelled as advance profit, to another company owned by the Sheikh. The three Kaupthing bankers involved in the transaction – Hreiðar Már Sigurðsson, Sigurður Einarsson and Kaupthing Luxembourg’s director Magnús Guðmundsson – and also Ólafur Ólafsson were charged for breach of fiduciary duty and market manipulation and sentenced to between three and five and half years in prison (further on Icelog on the Icelandic al Thani case). Although the case was called “the Al Thani case,” the Sheikh was not charged with any wrongdoing. Kaupthing had further plans of joint ventures with the Sheikh. In summer 2008 there had been an announcement, duly noted in the Icelandic media, that the Sheikh was investing in Alfesca, owned by Ólafsson. According to the SIC report, also here the plan was that Kaupthing would finance Sheikh Al Thani’s Alfesca investment. In August and September 2008 Kaupthing, advise by Deutsche Bank, financed credit linked notes, CLN, transactions linked to Kaupthing’s credit default swaps, CDS, in order to influence, or rather manipulate, the CDS spreads. Two rounds of transactions were carried out: first via companies owned by a group of Kaupthing clients, then on behalf of Ólafur Ólafsson. A third round was planned, via a company owned by Sheikh Mohammed Bin Khalifa Al Thani, mimicking the earlier transactions, again with Deutsche Bank. Neither the Sheikh’s involvement with Alfesca nor the CDS trades happen as Kaupthing had run out of time and money (further on the CDS saga, see Icelog). Kaupthing was a small fry in the financial ocean, Barclays a much bigger fish. Already in spring of 2008, funding worries at Barclays were rising – the share price was falling, market conditions worsening. As Marcus Agius, Barclays chairman of the Barclays’ board 2006 to 2012, recently a witness for the prosecution in the criminal case against the four Barclays bankers, explained in court 19 February 2019, Barclays wanted to be ahead of the market, i.e. adequately capitalised: in the summer of 2008 it was time to raise capital, in fierce competition with other banks. Consequently, Barclays decided to raise capital and underwriting was arranged. As summerised in Barclays 2008 Annual Report: On 22nd July 2008, Barclays PLC raised approximately £3,969m (before issue costs) through the issue of 1,407.4 million new ordinary shares at £2.82 per share in a placing to Qatar Investment Authority, Challenger Universal Limited (a company representing the beneficial interests of His Excellency Sheikh Hamad Bin Jassim Bin Jabr Al-Thani, the Chairman of Qatar Holding LLC, and his family), China Development Bank, Temasek Holdings (Private) Limited and certain leading institutional shareholders and other investors, which shares were available for clawback in full by means of an open offer to existing shareholders. Valid applications under the open offer were received from qualifying shareholders in respect of approximately 267 million new ordinary shares in aggregate, representing 19.0 per cent. of the shares offered pursuant to the open offer. Accordingly, the remaining 1,140.3 million shares were allocated to the various investors with whom they had been conditionally placed. The Qatari investors were new to Barclays. At the time, Barclays’ top management saw it as highly beneficial for the bank to attract major investors from the Middle East, according to Agius. Keen to expand, the bank aimed at being a global player. The Qatari connection fitted the bank’s vision of its goal in the international world of finance. In autumn 2008, market conditions went from worrying to worse than anyone had thought possible, according to Agius’ witness statement in court. There were only two options: accept state funding or try another capital raising. Barclays hoped to again raise capital from the Qataris. This time, the Qataris brought another Middle Eastern investor to the table, Sheikh Mansour Bin Zayed al Nahyan. Interestingly, there was some confusion if an Abu Dhabi public body was investing or if Sheikh Mansour was investing privately as Barclays publicly stated to begin with. In the end, the investor turned out to be International Petroleum Company where Sheikh Mansour was a chairman. The Abu Dhabi investment saga is an even more colourful financial thriller than the Qatari saga. An independent financier Amanda Staveley advised Sheikh Mansour and got at least 30m of the £110m Sheikh Mansour allegedly got in fees from Barclays. In addition, Staveley’s company has sued Barclays for fees of £720m plus interests and cost, potentially well over £1bn,in relations to Sheikh Mansour’s investment. Her case is on hold until the criminal case against the Barclays four is brought to an end. Somewhat ungracefully, the Barclays bankers referred to Staveley as a “tart” in a telephone recording played at the Southwark County Court recently during the Barclays trial. Intriguingly, this name-calling came from one of the charged bankers, Roger Jenkins, who argued for £25m bonus for 2008 as he had been instrumental in bringing in the Sheikhs, rather belittling Staveley’s part in it. There was panic in the autumn air of 2008. Barclays fought to raise capital in order to avoid making use of the 8 October 2008 banking package, in total a staggering £500bn on offer from the government; for comparison, the total government annual spending was 618bn. One condition: participating banks would have to sign up to an agreement with the FSA on executive pay and dividend, making it rather unappealing for the well-paid Barclays bankers. Further, Barclays issued warrants on 31 October 2008 “in conjunction with a simultaneous issue of Reserve Capital Instruments [RCI] issued by Barclays Bank PLC … to subscribe for up to 1,516.9 million new ordinary shares at a price of £1.97775 to Qatar Holding LLC and HH Sheikh Mansour Bin Zayed Al Nahyan. The warrants may be exercised at any time up to close of business on 31st October 2013.” – Qatar Holding now held 6.4% of Barclays shares. Fund raising in these tumultuous times, as banks were scurrying for government money, might have looked like quite a feat. But the reception to Barclays fundraising was disappointing: the news came as a surprise to the market and existing shareholders were dismayed; also because the fund raising had not been a normal process, Agius said in court. Reaching the agreement with the Sheikhs had been tough. In an email to Roger Jenkins John Varley said the Qataris and Sheikh Mansour had had “too good a deal.” It did in fact prove difficult to get shareholders to agree; many of the smaller shareholders were very upset. At least one large shareholder in Barclays voiced concern publicly: though at the time not knowing how high the cost was indeed for Barclays, the pension fund Scottish Widows claimed the capital raising had been driven through at a high cost, just to avoid state ownership and its effect on bonuses. However, by the end of November Barclays shareholders had agreed to the capital raising. It was indeed an expensive undertaking: the official terms seemed quite generous, 2% on the RCIs, 4% on the MCNs, as Agius pointed out in court. The RCIs carried interests of 14% until June this year, 2019, (see 2008 Annual Report p.228) when the rate would be 13.4% on top of three months LIBOR. The initial coupon was deemed to carry a cost of 10% after tax for Barclays. In addition, there was a disclosed fee of £66m to the Qatari investors, for having introduced Sheikh Mansour. What Agius and others at the bank say they did not know was that the cost of extracting investment from the Qatari and Abu Dhabi Sheikhs were even higher than disclosed. The four Barclays bankers agreed to fees totalling £322m, to be paid over 60 months, hidden in two so-called “Advisory Services Agreements,” ASAs, now the focus of the SFO case against the Barclays four. What transpires from the Barclays court case is that the three Sheikhs wanted fees for investing; the original figure floated was £600m. It was not trivial to dress up the agreed fee as anything remotely acceptable: after all, these three investors were getting fees no other investors were offered. When the “Advisory Services Agreements” surfaced in communication between the Barclays bankers and the Qataris negotiating on behalf of the Middle Eastern investors as a way for Barclays to pay the companies investing, it turned out that Sheikh Hamad bin Jassim bin Jabr Al Thani also wanted fees for his personal investment. The bankers saw the absurdity in an ASA with a prime minister: he could not be an adviser to Barclays any more than a US president could be an adviser to JP Morgan! The solution was to increase the total payment for the ASAs to QIA: there would probably be some means to get the extra funds from QIA to its chairman, Sheikh Hamad bin Jassim bin Jabr Al Thani. The thrust of the criminal case against the four Barclays bankers is if the fees were paid for real service, if any services were given in return for the exorbitant fees. So far, witnesses have not been aware of any services given; indeed, Agius and other witnesses were not aware of the ASAs until some years later, when the they surfaced in relation to the SFO investigation. It is also known that the Qatari investors got a loan of $3bn from Barclays at the time, which is interesting given the Kaupthing story. This information surfaced in SFO charges against Barclays bank itself; this case was however dismissed in May 2018 by the Crown Court; in October 2018 the High Court ruled against SFO’s application to reinstate the case. As time passed, the German bank behemoth, weighed down by falling share prices inter alia caused by scandals and fines for financial misdemeanour and sheer criminal acts in various countries, struggled to stay above required capital ratio. Already in 2014, there were news of Qatari investments in Deutsche Bank according to Der Spiegel: the deal in 2014 had been arranged by the then CEO of Deutsche, Anshu Jain. Of course, Jain knew Sheikh Hamas bin Jassim Bin Jabr Al Thani, one of the wealthiest and most influential men in the Gulf. The Sheikh had long been a valued Deutsche customer, even before the 2014 investment of €1.75bn in Deutsche made him one of the larger shareholders in Deutsche. In autumn 2016, more was needed. Again, the Sheikh was ready to invest, this time with Sheikh Hamad Bin Khalifa Al Thani, the Kaupthing investor. The two surpassed BlackRock as Deutsche’s largest shareholders, via two investment vehicles, the BVI-registered Paramount Services Holdings Ltd and Supreme Universal Holdings Ltd., registered in the Cayman Islands, respectively owned by Sheikh Jassim and Sheikh Khalifa. With the Kaupthing saga in mind, I sent some questions to Deutsche Bank in August 2016, asking if Deutsche knew how the Qatari shareholders had financed their investment in the bank, if Deutsche could guarantee that the bank was not lending the Qatari shareholders, or anyone related to them, the invested funds, entirely or partly, and if the Qataris were getting in dividend in advance or other benefits that might later arise from their investments. Special agreements with individual shareholders would be a breach of the stock corporation act. We want to point out, that allegations or the mere assumption that the Supervisory Board or the Management Board could enter into such an agreement or could have entered into such agreement, are absolutely unfounded and is highly defamatory. There is absolutely no indication to justify such a reporting or any allegation of this kind. In addition to the Icelandic Al Thani case, I pointed out that Deutsche had quite some track record in being fined or scrutinized for various illegal activities, which made the tone in the answer somewhat surprising and a tad misplaced. In addition, I mentioned that the Qatari shares purchase in Deutsche Bank, at a crucial time for the bank, had intriguingly, been just high enough to be flagged (as with the Al Thani Kaupthing investment); exactly this fact had caused attention in the media in various countries, an interest reflected in my question. I was merely trying to understand the situation, based on what had transpired in Kaupthing and Barclays with Qatari investors. As Der Spiegel pointed out, there have long been rumours about the origin of the fortune of Sheikh Hamas bin Jassim Bin Jabr Al Thani “some of which don’t cast a particularly flattering light on the sheikh…” He himself has mentioned that his wealth, “like that of all Qataris, may be questionable from a Western point of view. But according to Qatari standards, it was legitimate and had been obtained through legitimate business.” – And, as Der Spiegel noted, the Sheikh had a predilection for investing in the financial sector. When the long-troubled Dexia sold Banque International a Luxembourg, BIL, in 2011, the Sheikh bought 90% of the shares via a Luxembourg company, Precision Capital, for €750m, with the remaining 10% going to the Luxembourg government, indirectly giving the bank a touch of state guarantee. BIL has offices in Switzerland, the Middle East and in Denmark, since 2000, and Sweden since 2016. In 2017, Precision Capital sold its holdings in BIL for €1.6bn, more than double the purchase price less than six years earlier. The buyer was Legend Holdings, a Chinese investment fund with roots in the technology industry, best known as the owner of Lenovo Group. The Chinese fund enthusiastically touted its BIL acquisition as a new Chinese European co-operation and the fund’s gateway into Europe. BIL is well connected in tiny Luxembourg: the chairman of the board is Luc Frieden, former minister for various ministries in Jean-Claude Juncker’s governments, last minister of finance 2009 to December 2013 when both Juncker, now president of the European Commission since 2014 and Frieden left Luxembourg politics. After politics, Frieden joined Deutsche Bank as vice chairman in 2014. Based in London, he advised the bank on international and European matters, as well as being chairman of Deutsche’s supervisory board in Luxembourg, until he joined BIL’s Board in early 2016, a post he kept after Legend Holdings became the bank’s largest shareholder. In 2012, Precision Capital also bought a Luxembourg banking group, KBL European Private Bankers, which owns seven small banks and asset managing firms spread over Europe. One of them is Merck Finck, with sixteen offices in Germany. Legend Holdings purchase of BIL coincided with other Chinese companies buying into European banks. Fosun is now the largest shareholder in Portugal’s largest listed bank, Millennium BCP, holding 24% of its shares. Most noticeable was however HNA Group interest in Deutsche Bank.The HNA Group, formerly Hanan Airlines, holds €83bn in global assets, mainly in hotels and airlines. HNA Group is not state-owned but its chairman, Chen Feng, is a member of the National Congress of the Chinese Communist Party. In 2017 HNA Group had suddenly become Deutsche’s largest shareholder, peaking with a shareholding of just under 10%. HNA Group announced in September 2018 it would sell its stake of 7.6% over the coming 18 months; it is no longer among the largest shareholders in Deutsche. The Chinese interest in European banks has been a cause for concern and controversy, both in terms of political ties to Chinese authorities and in terms of management issues. The 2014 purchase of Deutsche Bank shares was at the time seen as Sheikh Hamas bin Jassim Bin Jabr Al Thani’s most important strategic investment so far in European banks. In 2016, there had been rumours that the Qataris aimed at owning anything up to 25% of shares in Deutsche and were interested in exerting greater influence on the bank, which was not run to their taste. However, no such drastic steps were taken though the Sheikh showed support for Deutsche’s chairman, Paul Achleitner who faced criticism after the bank’s shares lost 50% of their value in early 2016. The position of the largest shareholder in Deutsche has been wandering between a few firms. BlackRock had long been the largest shareholder until the investment by two Qatari-owned companies. In May 2017, the order changed as Deutsche raised capital. Although the two Qatari companies had been rumoured to be willing to increase their shareholding, they did not. Not then. This was when the Chinese HNA Group replaced the two Qatar companies as the largest shareholder, holding just under 10%, a stake worth approximately €3,4bn. Shortly after the investment in Deutsche Bank, Hanan Group’s chairman Chen Feng visited Doha and met with Qatar dignitaries. Now, BlackRock is again Deutsche’s largest single shareholder with 4.88%. However, the two Qatari companies, Paramount Services Holdings and Supreme Universal Holdings, each hold respectively exactly 3.05% and should for all practical purposes be seen as operating together, again making them the largest shareholder with 6.10%. For years, Deutsche insiders have been searching for a turn-around plan for the bank without a clear success. Deutsche is now at a critical point: the echelons of power in Deutsche and the German government have come to the conclusion that the problem of two weak large banks – Deutsche and Commerzbank – will best be solved by merging them. Again, Deutsche is in need of capital. It now seems that the public Qatar entity, QIA, stands ready to invest in Deutsche. A strategic investment as Qatar’s deputy prime minister and minister of foreign affairs Sheikh Mohammed bin Abdulrahman Al Thani, also chairman of QIA, has stated that Qatar is interested in further investments in Germany. Recently, Deutsche reluctantly disclosed a hidden loss of $1.6bn, stemming from municipal bond-investment from a run-up to the 2008 crisis, which does little to strengthen the bank’s position prior to the merger with Commerzbank. – And then there is the latest scandal: Deutsche’s involvement in Danske Bank’s laundering of €230bn through its Estonian branch. In the end, Deutsche might be not only need capital but also moral vision, which might not necessarily come with Qatari funds. The Qatari investment in Credit Suisse in 2008 was definitely a turning point for the bank and saved it from needing a state bailout. Though Qatar Holding has lowered its shareholding in the bank, it is still the largest shareholder with 5.21%, followed by Harris Associates, Norges Bank, the Olayan Group, owned by a Saudi family investing in the West since the 1950s and BlackRock. The investment in Credit Suisse 2008 did not come cheaply for the bank: as in Barclays, the investment was more complicated than just buying shares. It was designed as convertible bonds in Credit Suisse, with a coupon of between 9 and 9.5%. This means that while regular shareholders have seen meagre dividends, Qatar Holding collects CHF380m each year from Credit Suisse. Until February 2017, an Al Thani of the younger generation, Sheikh Jassim bin Hamad Al Thani, son of Sheikh Mohammed Bin Khalifa Al Thani, was on the board. When the young Sheikh stepped down, apparently without explanation, he was not replaced by another Qatari. His departure did not make much difference on the board except there would be fewer cigarette breaks without him. At the time, there were speculations that Qatar Holding would be selling its stake in the bank, that Credit Suisse might be cutting the ties to the Qataris and would possibly use the opportunity to replace the convertible bonds with less expensive options as they came callable in 2018. The bank did indeed do that at first opportunity, October 23 2018. In order to cut funding cost, it bought back around CHF5.9bn of debt issued after the financial crisis to QIA and the Olayan family; Qatar held just over CHF4bn, Olayan Group the rest, both being entitled to 9.5% on the securities. The Qatar shareholding in Credit Suisse briefly dipped below 5% last year but then rose again to the present 5.21%. Some changes were made to the board in February 2019 but it is as if the Qataris have lost interest in the bank: in spite of being the largest shareholder they have not had a representative on the board since 2917.
Who learns what from whom? There was a sham agreement with Qatari investors at the core of the Icelandic criminal case against the three Kaupthing bankers and the bank’s second largest shareholder parallel to the sham agreement with Qatari investors at the core of the Barclays case. It is not surprising to hear of corrupt business practices in the Middle East – it is known as a thoroughly corrupt part of the world with fabulously wealthy rulers where neither democracy nor transparency is a priority. As can be seen from the billions of pounds, dollars and euros, paid in fines by systemically important Western banks in less than a decade, partly for criminal activity, these banks do not have the highest of moral standards either. The belief, perhaps a naïve one, was that when businessmen from corrupt parts of the world would do business with Western banks they would have to adhere to Western standards. Apart from the moral standards in Western banks clearly being shockingly low in too many cases, it seems that bankers at Barclays – and Kaupthing – were ready to meet the Middle Eastern investors at the level set by the investors. The question is how other banks have met the requests for the special treatment Middle Eastern investors seem prone to demand. “It’s not unlikely that an international bank wants to avoid being accused of market manipulation,” said Prosecutor Björn Þorvaldsson in Reykjavík District Court on October 11, 2017. The “international bank” was Deutsche Bank and the court case was the so-called CLN case. Deutsche was not charged with anything – the criminal case was against Kaupthing managers, charged with fraudulent lending of €510m into a scheme concocted with Deutsche. However, both Kaupthing administrators and liquidators of two BVI companies saw a way of using alleged market manipulation in these transactions to recover from Deutsche the €510m, Kaupthing had paid to Deutsche. In December 2016, Deutsche eventually concluded that paying €425m was preferable to having to recount the ignominious saga in court. All parties to the agreement are unwilling to divulge further facts but a UK court document throws light on Deutsche’s part in the alleged market manipulation, affecting not only Kaupthing’s CDS spreads but also the bond market. – The question is if this really was the only scheme of alleged market manipulation that Deutsche instigated. Further, the case throws light on how tension between Deutsche’s staff working on the scheme and those responsible for legal and reputational risk was dealt with, potentially explaining the same in other Deutsche schemes. In January 2009, Kaupthing’s ex-chairman Sigurður Einarsson felt compelled to send a letter to family and friends to counter claims in the Icelandic media regarding Kaupthing’s activities in the months before the bank failed in October 2008. One was that in 2008 the bank had traded on its own credit default swaps, CDS, linked to credit-linked notes, CLN, to bring down the bank’s CDS spreads and thus lower the bank’s cost of financing. Einarsson wrote that Kaupthing had indeed funded such transactions, via what he called “trusted clients” in cooperation with Deutsche Bank; the underlying assumption was that a reputable international bank would not have done anything questionable – those were the days before international banks like Deutsche were being questioned and fined for criminal actions. The Icelandic 2010 Special Investigations Committee, SIC, report told the CDS saga in greater detail, documenting Deutsche’s full knowledge from the beginning. A 2012 London court decision added to the story: in order to recover documents related to the transactions, Stephen Akers and Mark McDonald from Grant Thornton London – appointed liquidators of two BVI companies, Chesterfield and Partridge, used in the CDS transactions in the names of the “trusted clients” – had brought Deutsche Bank to court. The CDS saga was summed up in 2014 charges in a criminal case in Iceland: Einarsson, Kaupthing’s CEO Hreiðar Már Sigurðsson and head of the bank’s Luxembourg operations Magnús Guðmundsson were charged with breach of fiduciary duty, causing a loss of €510m to Kaupthing, some of which Kaupthing paid to Deutsche literally as Kaupthing was failing. – All of this has earlier been reported in detail on Icelog(most notably here, December 2015 and here, November 2017). The latest addition to the CDS saga is in another court document, consolidated particulars* from 2014, as the liquidators of the two BVI companies sought to recover funds from Deutsche in a civil case by suing Sigurðsson, Einarsson, Venkatesh (or Venky) Vishwanathan the Deutsche senior banker who liaised with Kaupthing on the CLN trades and, most importantly, the liquidators sued Deutsche Bank. The fifth defendant was Jaeger Investors Corp., BVI, a director nominee for Chesterfield and Partridge. The 2014 document shows, in extensive quotes from emails etc., that contrary to Deutsche’s version in its Annual Reports etc., the bank was fully aware of the fact that Kaupthing set up these trades and funded them in order to influence its CDS spreads, i.e. allegedly the scheme was effectively a market manipulation. In addition, the Icelandic criminal case related to the CLN transactions documented that Deutsche was on the other side of the bet, thereby effectively creating a hedge for itself. Thus the Icelandic SIC, the Icelandic Special Prosecutor, the Kaupthing administrators and of course the liquidators of the two BVI companies have all come to the same conclusion: Kaupthing and Deutsche colluded in market manipulation. This goes a long way to explain why Deutsche, by the end of 2016, chose to settle with Kaupthing – Deutsche Bank was not going to be dragged into court to explain the discrepancy between its public statements and internal Deutsche documents, in addition to profiting from being a counterparty in the transactions. The liquidators alleged Deutsche took part in criminal activity. This has however not been tested in court; the SFO had as early as 2010 looked at these transactions but later apparently dropped its investigation as so many others. One intriguing aspect of the CLN transactions is that Deutsche staff took measures to hide facts from staff working on legal and reputational risk. This has immense ramification for so many other questionable transactions in the bank, which have come to light over the last few years, inter alia Deutsche’s involvement in the largest known case of money laundering of all times: Danske Bank money laundering in Estonia 2007 to 2015, a saga still in the making. Deutsche first mentioned the CLN claims in its 2015 Annual Report (p. 340). As an introduction to the bank’s 2016 Annual Report, Deutsche CEO John Cryan sent out a message to the bank’s employees on February 2 2017 where the settlement with Kaupthing was one of four legal issues the bank had resolved and chose to emphasise. In June 2012, Kaupthing hf, an Icelandic stock corporation, acting through its winding-up committee, issued Icelandic law claw back claims for approximately € 509 million (plus costs, as well as interest calculated on a damages rate basis and a late payment rate basis) against Deutsche Bank in both Iceland and England. The claims were in relation to leveraged credit linked notes (“CLNs”), referencing Kaupthing, issued by Deutsche Bank to two British Virgin Island special purpose vehicles (“SPVs”) in 2008. The SPVs were ultimately owned by high net worth individuals. Kaupthing claimed to have funded the SPVs and alleged that Deutsche Bank was or should have been aware that Kaupthing itself was economically exposed in the transactions.Kaupthing claimed that the transactions were voidable by Kaupthing on a number of alternative grounds, including the ground that the transactions were improper because one of the alleged purposes of the transactions was to allow Kaupthing to influence the market in its own CDS (credit default swap) spreads and thereby its listed bonds. Additionally, in November 2012, an English law claim (with allegations similar to those featured in the Icelandic law claims) was commenced by Kaupthing against Deutsche Bank in London (together with the Icelandic proceedings, the “Kaupthing Proceedings”). Deutsche Bank filed a defense in the Icelandic proceedings in late February 2013. In February 2014, proceedings in England were stayed pending final determination of the Icelandic proceedings. Additionally, in December 2014, the SPVs and their joint liquidators served Deutsche Bank with substantively similar claims arising out of the CLN transactions against Deutsche Bank and other defendants in England (the “SPV Proceedings”). The SPVs claimed approximately € 509 million (plus costs, as well as interest), although the amount of that interest claim was less than in Iceland. Deutsche Bank has now reached a settlement of the Kaupthing and SPV Proceedings which has been paid in the first quarter of 2017. The settlement amount is already fully reflected in existing litigation reserves and no additional provisions have been taken for this settlement. As can be seen from the text, the wording is carefully calculated. Inter alia, Deutsche has never in its public statements mentioned when and how it learned of the realities of the scheme, i.e. it was funded by Kaupthing in order to manipulate its CDS spreads. Deutsche sent Venky Vishwanathan on leave in the spring of 2015 because of his involvement in the Kaupthing scheme. In 2016, Reuters reported that Vishwanathan was suing Deutsche for unfair dismissal. The status of his case is unclear; he has not responded to my queries on LinkedIn. In February 2008, at the time of the first meeting regarding the CDS spreads with Deutsche bankers, the Kaupthing management was smarting from steadily increasing financing cost; Kaupthing managers insisted the bank was unfairly targeted by hedge funds and were trying to figure out how Kaupthing could erase the image of weakness implied by the CDS spreads. Already at the first meeting with Venky Vishwanathan it was abundantly clear that Kaupthing was seeking to use own funds to influence the CDS spreads; that was the plan from the beginning – the question was just how to structure it in order to influence the CDS spreads most effectively. The CDS scheme was developed further in the coming months as the pressure on Kaupthing increased: in spring 2008, the CDS spreads stood alarmingly at 900bp. Deutsche advised against Kaupthing’s original idea of its own direct involvement in the transactions. The solution was to find trusted clients of Kaupthing – Kevin Stanford and his wife Karen Millen, Tony Yerolemou and Skúli Þorvaldsson, all large clients of Kaupthing – who would in name own Chesterfield, the BVI company, entirely funded by Kaupthing; the transactions would be done via Chesterfield. The Chesterfield transactions were done in August 2008. According to the SIC Report (p.26-28; in Icelandic), the CDS spreads changed on 10 August 2008, following the transaction, from 1000bp to 700bp. Though the spread diminished only for some days, it was deemed success, which should be repeated. For the second round, in September, the CLN transactions were done via another BVI company, Partridge, owned by Ólafur Ólafsson, domiciled in Switzerland, still a wealthy businessman, then Kaupthing’s second largest shareholder and a major borrower in Kaupthing. Again, the Partridge transactions were wholly funded by Kaupthing, organised by Deutsche on behalf of Kaupthing. Kaupthing accordingly lost the €510m because the two BVI companies had no assets to speak of, which made it clear from the beginning that should the trades go awry, the loans would be non-recoverable; a fact the liquidators noted, as did the Special Prosecutor in Iceland. A very intriguing part of this story surfaced in the SIC Report (p.26-28): there had been plans for a third round of Kaupthing-funded CLN transactions through Brooks Trading Ltd, owned by a Qatari investor, Sheikh Mohamed Khalifa al Thani. Kaupthing agreed to a loan of €130m to Mink Trading, an al Thani company, in addition to a loan of $50m to Brooks Trading Ltd, another al Thani company, as up-front profit from the trades. Again, the purpose of the loan to Mink Trading was to invest in CLN linked to Kaupthing’s CDS, again via Deutsche Bank in transactions structured as the Chesterfield and Partridge transactions. But Kaupthing ran out of time; the loan to Brooks Trading was paid out according to the SIC Report, not the loan to Mink Trading; the al Thani CLN transactions never happened. Sheikh al Thani is a well-known name in Iceland from his role in another Kaupthing criminal case, the so-called al Thani case; although the case is commonly named after the Sheikh he was not charged (the $50m loan to Brooks Trading might have been connected to the real al Thani case, not the CLN transactions, according the the SIC Report). In the al Thani case the three Kaupthing managers, charged in the CLN case, and Ólafur Ólafsson were sentenced to three to 5 ½ years in prison. As in the CLN case, the bankers were charged for fraudulent lending, breach of fiduciary duty and market manipulation; Ólafsson was sentenced for market manipulation. According to the SIC Report Kaupthing also agreed to lend Ólafsson €50m against profits from the Partridge trade but SIC documents do not show that the loan was issued. The liquidators of the two BVI companies, Stephen Akers and Mark McDonald, quickly seem to have sensed a potentially intriguing story behind the CDS transactions and had some impertinent questions for Deutsche Bank. When Deutsche was remarkably unwilling to answer their questions the liquidators took legal action against the bank in order to obtain documents, as seen in this UK court decision in February 2012. In his affidavit in the 2012 Decision, Akers said: “It is very difficult to see how the transactions made commercial sense for the Companies.” ­– As the liquidators were to uncover the short answer here is that the transactions did not make sense for the companies, which were only a tool for Kaupthing managers, as Deutsche full well knew. Already at the initial meeting in February 2008 it was clear that Kaupthing’s only reason for setting up the schemes was to bring down its CDS spreads and Kaupthing would fund the transactions; Kaupthing was willing to pay Deutsche for reaching this goal and Deutsche agreed to assisting Kaupthing in reaching it, i.e. bringing down its CDS spreads; from Kaupthing, its most senior managers were involved; at Deutsche, senior staff in London worked on the plan (para 56). A larger group were kept informed by emails, amongst them Jan Olsson managing director of Deutsche and CEO of Deutsche in the Nordics. A flurry of emails followed, also because Deutsche’s legal department was hard to please (para 68-69). The bank’s Global Reputational Risk Committee was involved. Kaupthing managers understood that Deutsche staff was “bit stressed about this from a ‘reputation’ point of view.” In July, Deutsche invited Hreiðar Már Sigurðsson and his family on a trip to Barcelona, i.e. paid for flights and hotel, where Sigurðsson attended DB’s Global Markets Conference and discussed the CDS scheme (para 75). The conclusion was that Kaupthing could not be seen to go directly into the market in transactions linked to its own CDS. The solution was to set up a Luxembourg company for the CDS trades, as Sigurðsson explained in an email to Vishwanathan during the conference: Kaupthing’s lawyer would be “setting up the lux company for our trade” (sic), also offering to discuss further “the right structure that you (i.e. Deutsche) would be comfortable with.” (para 79). That same day, Vishwanathan sent an email to a colleague informing him he was working on “putting together a bespoke ETF for some of (Kaupthing’s) close high net worth clients to take a view on (Kaupthing) CDS…” (para 80). Late July, Kaupthing’s lawyer in Luxembourg presented an overview in an email to Deutsche’s Shaheen Yusuf, including the ownership structure with the names of the four Kaupthing clients who owned Chesterfield. The presentation clearly stated that the funding, €125m, would come from Kaupthing and that the CLN used was part of a wider scheme where Deutsche would offer CDS for sale with a total nominal value of €250m (para 89). – This document included everything regarding the planned transactions, also the funding. As all of this is documented in email exchanges between Kaupthing managers and Deutsche staff it is clear that when Deutsche claims, inter alia in its 2015 and 2016 Annual Reports it did not know a) that the funding came from Kaupthing – and – b) that the aim of the transactions was to lower Kaupthing’s CDS spread, it goes against documents, which Deutsche had on its system at the time and should still have. Given that Deutsche’s legal department and its Global Reputational Risk Committee had been worried, the overview and its detailed information on funding etc. was unavoidably a strong dosis for Deutsche to stomach. Yusuf called Kaupthing – it’s not clear if she spoke to Hreiðar Már Sigurðsson or Magnús Guðmundsson – but her mission was to ask Kaupthing to withdraw the presentation and replace it with a new one where the fact that Kaupthing was funding the transactions would be omitted. The Kaupthing Luxembourg lawyer quickly followed her instructions, sending another presentation, with the requested changes: Kaupthing was no longer referenced as the lender. The BVI liquidators point out that there was a phone call and not an email, concluding this was done in order to avoid a paper trail at Deutsche (para 92-93). When the Chesterfield trades were executed in August 2008, the effect was immediate, just as Deutsche bankers had promised (para 114). In an email to Vishwanathan Hreiðar Már Sigurðsson said it seemed “our Barcelona trip paid of” (sic) – the trip where the plans were finalised (para 115-116). Indeed, so pleased were the Kaupthing managers that they decided to do another trade of the same kind (in spite of a very short-lasting effect) (para 117). This time, it would be through a company owned by Ólafur Ólafsson, very much a part of the Kaupthing’s inner circle and a close friend of the Kaupthing managers. Due to force majeur, the second CDS transactions hardly registered: Lehman Brothers collapsed on the 15 September 2008, shaking the world’s financial system to its core. Two days later, Kaupthing’s CDS spread had deteriorated further and stood at record 1150bp. As if nothing had happened in the world of finance, Magnús Guðmundsson, clearly less than pleased, wrote in an email to Vishwanathan: “How can the CDS spread be were they are compare to our trade(.) Are u not paid to work for us? (sic)” (para 128). This exchange clearly shows how Kaupthing saw Deutsche’s role – Deutsche was acting on behalf of Kaupthing, not for the owners of the two BVI companies. Both Kevin Stanford and Tony Yerolemou have stated they had no idea how the BVI companies in their name were used – they had no idea of the funds that flowed through their companies as Kaupthing strove to meet margin calls. – Interestingly, these are not the only examples of Kaupthing using clients’ companies without the owners’ knowledge. According to the liquidators, Deutsche Bank broke laws on market manipulation and market abuse not only in the UK but also in other countries where financial products, influenced by Deutsche’s unlawful activities, were traded. (para 143-145). This abuse and manipulation did not only affect Kaupthing’s CDS but also Kaupthing’s bonds as the manipulated CDS affected the pricing of Kaupthing bonds. In addition to market manipulation and being counterpart to trades Deutsche itself set up, the Kaupthing CLN transactions have other interesting aspects to ponder on. Emails between Deutsche staff show how employees involved in the Kaupthing transactions were allegedly prepared to withhold information on the owners of the BVI companies from Deutsche’s own know-your-customer team. Also, the staff was aware of the reputational risk from being involved in transaction where a bank tried to influence its own CDS spreads. There is nothing to indicate that this was done because the Deutsche bankers engaging with Kaupthing were less ethical than other colleagues or more prepared to stray away from the straight and narrow road of regulation – rather, that this was a way of working at the bank. It can only be assumed that in a case like this there was no guidance from the echelons of power at Deutsche, relevant to keep in mind given the enormous sums Deutsche has paid out over the years in fines, also in cases with criminal ramifications. The CLN saga shows the inner workings of Deutsche, relevant to understand how the bank’s internal safeguarding against illegal activities were side-lined when up against the possibility of profit. Relevant for so many other cases of questionable conduct that have surfaced in the last few years. Intriguing to keep in mind regarding the latest Deutsche scandal: it’s role in Danske Bank’s money laundering in Estonia where $230bn were laundered in 2007 to 2015, where Deutsche seems to have handled around $180bn. Another aspect is how keenly the Kaupthing managers honoured the agreement with Deutsche. Money was tight in August 2008 when the Chesterfield transaction was done. In September, money was quite literally running out and no doubt the three managers had a lot on their mind. Yet, they never lost focus on these transactions with Deutsche, diligently though with great effort meeting margin calls, even making use of the emergency lending from the Icelandic Central Bank. The managers have explained that Kaupthing’s relationship mattered greatly. Yet, given what was going on at the bank, the question still lingering in my mind why these transactions were apparently so profoundly important to the Kaupthing managers. Over the last few years, Deutsche Bank has been fighting regulators on all continents. In total, Deutsche paid fines of €14.5bn from March 2012 to July 2018 for criminal activity ranging from Libor fixing to money laundering, according to ZDF. And there might well be more to come as Deutsche is now involved in the largest money laundering saga of all times, Danske Bank’s laundering of $230bn from 2007 to 2015 where Deutsche allegedly handled close to $180bn of the $230bn. Intriguingly, in June 2010 the SFO was looking at Deutsche’s role in the CDS trades, according to the Guardian. But as with so much of suspicious activities in UK banks around 2008 (and forever!) nothing more was heard of SFO’s investigation. Deutsche has refuted having known about the realities of the CDS transactions – that Kaupthing was indeed funding the trades and doing it in order to lower its CDS spreads. However, the paper trail within the bank tells a very clear story, according to the liquidators: Deutsche full well knew the realities and thus took part in market manipulation that in the end affected not only the CDS spreads but, much more seriously, the price of Kaupthing’s bonds. The same was clear already from the SIC Reportand from the CLN criminal case in Iceland. As mentioned earlier on Icelog, the CLN charges (in Icelandic) support and expand the evidence of Deutsche’s role in the CDS trades. The charges show that Deutsche made for example no attempt to be in contact with the Kaupthing clients who at least on paper were the owners of the two companies; Deutsche was solely in touch with Kaupthing. Inter alia, the owners were not averted regarding margin calls; Deutsche sent all claims directly to Kaupthing, apparently knowing full well where the funding was coming from and who was making the necessary decisions. Another interesting question is who was on the other side of the CDS bets, i.e. who gained in the end when the Kaupthing-funded companies lost so miserably? Deutsche’s fees for the two CLN transactions amounted to €30m for the total CDS transactions of €510m. In addition, Deutsche will have profited from going into the market buying “a considerable part of the CDS” thus hedging its risk related to Kaupthing. Effectively, Deutsche was not interested in having the realities of the case tested in court – it did not want to spell out in court its part in the Kaupthing market manipulation and it did not want to spell out it had itself been a counterpart in the trades. After years of legal wrangling, it chose to settle with Kaupthing and agreed to pay back €425m of the €510m Kaupthing paid to Deutsche for these transactions. – Another case of alleged banking fraud buried in the UK. *Published by Kjarninn Iceland as an attachment to an open letter (in English but the attachments are linked to the Icelandic version) to Hreiðar Már Sigurðsson and Magnús Guðmundsson from the well-known UK retailer, Kevin Stanford. He and his ex-wife Karen Millen were clients of Icelandic banks, also of Kaupthing. – All emphasis above is mine. The Bill passed by the Icelandic parliament in December 2008 on setting up an independent investigative commission, the Special Investigative Commission did not catch much attention at the time. The goal was nothing less than finding out the truth in order to establish events leading up to the 2008 banking collapse, analyse causes and drawing some lessons. The SIC report was an exemplary work and immensely important at the time to establish a narrative of the crisis. But in hindsight, there is yet another lesson to be learnt: its importance does not diminish with time as it helps to counteract special interests seeking to rewrite history. There were no big headlines when on 12 December 2008 Alþingi, the Icelandic parliament, passed a Bill to set up an investigative commission “to investigate and analyse the processes leading to the collapse of the three main banks in Iceland,”which had shaken the island two months earlier. The palpable lack of enthusiasm and attention was understandable: the nation was still stunned and there was no tradition in Iceland for such commissions. No one knew what to expect, the safest bet was to not expect very much. That all changed when the Commission presented its results in April 2010. Not only was the report long – 2600 pages in print in addition to online-only material – but it did actually tell the real story behind the collapse: the immensely rapid growth of the banks, from one GDP in 2002 to ten times the GDP in 2008, the stronghold the largest shareholders, incidentally also the largest borrowers, had on the banks’ managements, the political apathy and lax regulation by weak regulators, stemming from awe of the financial sector. Unfortunately, the SIC report was not translated in full into English; see executive summary and some excerpts here. With time, the report’s importance has not diminished: at the time, it clarified what had happened thus preventing those involved or others with special interest, to reshape the past according to their own interests. With time, hindering the reshaping of the past has become of major importance, also in order to draw the right lessons from the calamitous events in October 2008. According to the December 2008 SIC Act (in Icelandic), the goal was setting up an investigative commission, that would, at the behest of Alþingi, seek “the truth about the run-up to and the causes of the collapse of the Icelandic banks in 2008 and related events. [The SIC] is to evaluate if this was caused by mistake or neglect in carrying out law and regulation of the financial sector in Iceland and its supervision and who could be held responsible for it.” – In order to fulfil its goal the SIC was inter alia to collect information on the financial sector, assess regulation or lack thereof and come up with proposals to prevent the repetition of these events. In some countries, most notably in South Africa after apartheid, “Truth Commissions,” have played a major part in reconciliation with the past. Although the remit of the Icelandic SIC was to establish the truth, the SIC was never referred to as a “truth commission” in Iceland though that concept has been used in foreign coverage of the SIC. The SIC had the power to make use of a vast array of sources, both by calling in people to be questioned and documents, public or private such as bank data, including data on named individuals, data from public institutions, personal documents and memos. Data, normally confidential, had to be shared with the SIC, which was obliged to operate as any other public body handling sensitive or confidential information. Although the SIC had to follow normal procedures of discretion on personal data the SIC could “publish information, normally subject to discretion, if the SIC deems this necessary to support its conclusions. The Commission can only publish information on personal matters of named individuals, including their financial affairs, if the public interest is greater than the interest of the individuals concerned.” – In effect, this clause lift banking secrecy. One source close to the process of setting up the SIC surmised the political intentions behind the SIC Act did not include lifting banking secrecy, indicating that the extensive powers given to the SIC were accidental. Others have claimed the SIC’s extensive powers were always part of the plan. I am in two minds about this but my feeling is that the source close to the process was right – the powers to scrutinise the main shareholders were far greater than intended to begin with. Intentional or not, the extensive powers enabled naming the individuals who received the largest loans from the banks, incidentally their largest shareholders and their closest business partners. This was absolutely essential in order to understand how the banks had operated: essentially, as private fiefdoms of the largest shareholders. In order to encourage those called in for questioning to speak freely, the hearings were held behind closed doors; there were no public hearings. The SIC had extensive powers to call people in for questioning: it could ask for a court order if anyone declined its invitation, with the threat of taking that person to court on grounds of contempt in case the invitation was declined. The SIC’s assessment, pursuant to Article 1(1) of Act no. 142/2008, was mainly aimed at the activities of public bodies and those who might be responsible for mistakes or negligence within the meaning of those terms, as defined in the Act. Although the SIC was entrusted with investigating whether weaknesses in the operations of the banks and their policies had played a part in their collapse, the Commission was not expected to address possible criminal conduct of the directors of the banks in their operations. As to suspicion of civil servants having failed to fulfil their legal duties, the SIC was supposed to inform appropriate instances. The SIC was not obliged to inform the individuals in question. As to ministers, the SIC was to follow law on ministerial responsibility. The SIC Act stipulated it should have three members: the Alþingi Ombudsman, then as now Tryggvi Gunnarsson, an economist and, as a chairman, a Supreme Court Justice. The nominated economist was Sigríður Benediktsdóttir, then lecturer at Yale University (director of Financial Stability at CBI 2012 to 2016 when she returned to Yale). The chairman was Páll Hreinsson (since 2011 judge at the EFTA Court). In addition to the Commission there was a Working Group on Ethics: Vilhjálmur Árnason professor of philosophy, Salvör Nordal director of the Centre for Ethics, both at the University of Iceland and Kristín Ástgeirsdóttir director of the Equal Rights Council in Iceland. Their conclusions were published in Vol. 8 of the SIC report. In total, the SIC had a staff of around 30 people. As with the Anton Valukas report, published in March 2010, on the collapse of Lehman Brothers, organising the material, especially the data from the banks, was a major task. The SIC had access to the databases of the three collapsed banks but had only limited data from the banks’ foreign operations. There were absolutely no leaks from the SIC, which meant it was unclear what to expect. Given its untrodden path, the voices expressing little faith were the most frequently heard. I had however heard early on, that the SIC had a firm grip on turning material into searchable databases, which would mean a wealth of material. With qualified members and staff, I was from early on hopeful that given their expertise of extracting and processing data the SIC report would most likely prove to be illuminating – though I certainly did not imagine how extensive and insightful it turned out to be. After the October 2008 collapse, my attention had been on some questionable practices that I heard of from talking to sources close to the failed banks. One thing I had quickly established was how the banks, through their foreign subsidiaries, had offshorised their Icelandic clients. This counted not only for the wealthy businessmen who obviously understood the ramifications of offshorising but also people with relatively small funds. These latters had in many cases scant understanding of these services. In the last few years, as information on offshorisation has come to the light via Offshoreleaks etc., it has become clear that Iceland was – and still is – the most offshorised country in the world (here, 2016 Icelog on this topic). Once the “art” of offshorisation is established, with all the vested interests accompanying it, it does not die easily – this might be considered one of the failed banks’ more evil legacies. Another point of interest was how the banks had systematically lent clients, small and large, funds to buy the banks’ own shares, i.e. Kaupthing lent funds to buy Kaupthing shares etc. Cross-lending was also a practice: Bank A would lend clients to buy Bank B shares and Bank B lent clients to buy Bank A shares. This was partly used to hinder that shares were sold when buyers were few and far behind, causing fall in market value. In other words, massive market manipulation had slowly been emerging. Indeed, the managers of all three failed banks have in recent years been sentenced for market manipulation. It had also emerged, that the banks’ largest shareholders/clients and their business partners had indeed been what I have called “favoured clients,” i.e. enjoying services far beyond normal business practices. One side of this came to light in the banks’ covenants in lending agreements: in the case of the “favoured clients,” the lending agreements tended to guarantee clients’ profit, leaving the banks with the losses. In other words, the banks took on far greater portion of the risk than these clients. Icelog blogs I wrote in February 2010, before the publication of the SIC report, give some sense of what was known at the time. Already then, it seemed fair to conclude that greed, fraud and the collapse of common sense had been decisive factors in the event in Iceland in October 2008. The excitement in Iceland on Monday morning 12 April 2010 was palpable. The press conference was transmitted live. All around Iceland employers had arranged for staff to watch as the SIC presented its conclusions. After Páll Hreinsson’s short introduction, Sigríður Benediktsdóttir gave an overview of the main findings regarding the banks, presenting “The main reasons for the collapse of the banks,” followed by Tryggvi Gunnarsson’s overview of the reactions within public institutions (here the presentations from the press conference, in Icelandic). The main reason for the collapse of the three banks was their rapid growth and their size at the time they collapsed; the three big banks grew 20-fold in seven years, mainly 2004 and 2005; the rapid expansion into new/foreign markets was risky; administration and due diligence was not in tune with the banks’ growth; the quality of loans greatly deteriorated; the growth was not in tune with long-time interest of sound banking; there were strong incentives within the banks grow. Easy access to short-term lending in international markets enabled the banks’ rapid growth, i.e. the banks’ main creditors were large international banks. With the rapid expansion, also abroad, the institutional framework in Iceland, inter alia the Central Bank and the FME, quickly became wholly inadequate. The under-funded FME, lacking political support, was no match for the banks, which systematically poached key staff from the FME. Given the size of the humungous size of the Icelandic financial system relative to GDP there was effectively no lender of last resort in Iceland; the Central Bank could in no way fulfil this role. This had no doubt be clear to the banks’ management for some time. In his book, “Frozen Assets,” published in 2009, Ármann Þorvaldsson, manager of KSF, Kaupthing’s UK operation, writes that he “always believed that if Iceland ran into trouble it would be easy to get assistance from friendly nations… despite the relative size of the banking system in Iceland, the absolute size was of course very small.” (P. 194). – A breath-taking recklessness, naivety or both but might well have been the prevalent view at the highest echelons of the Icelandic financial sector at the time. The largest exposures of the three large banks were to the banks’ largest shareholders. “This raises the question if the lending was solely decided on commercial terms. The banks’ operations were in many ways characterised by maximising the interest of the large shareholders who held the reins rather than running a solid bank with the interest of all shareholders in mind and showing reasonable responsibility towards shareholders.” – Creative accounting helped the banks to avoid breaking rules on large exposures. 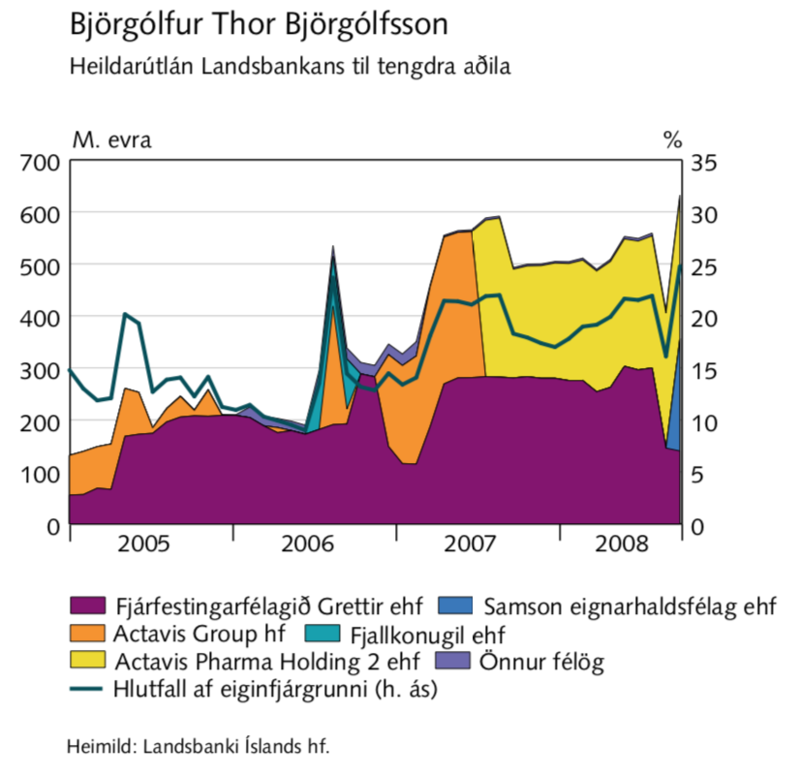 Benediktsdóttir showed graphs to illustrate the lending to the largest shareholders in the various banks. It is worth keeping in mind that these large shareholders all had foreign assets and were all clients of foreign banks as well. In general, the Icelandic lending shot up in 2007 when international funding dried up. At this point, the Icelandic banks really showed how favoured the large shareholders were because these clients were, en masse, getting merciless margin calls from their foreign lenders. In reality, the Icelandic banks were at the mercy of their shareholders. If the large shareholders and/or their holding companies would default, the banks themselves were clearly next in line. The banks could not make margin calls where their own shares were collateral as it would flood the markets with shares no one wanted to buy with the obvious consequence of crashing share prices. Two of the graphs from the SIC report, shown at the press conference in April 2010, exposed the clear drift in lending at a decisive time: to Björgólfur Thor Björgólfsson, still an active investor based in London and to Fons, a holding company owned by Pálmi Haraldsson, who for years was a close business partner of Jón Ásgeir Jóhannesson, once a king on the UK high street with shops like Iceland, Karen Millen, Debenhams and House of Fraser to his name. 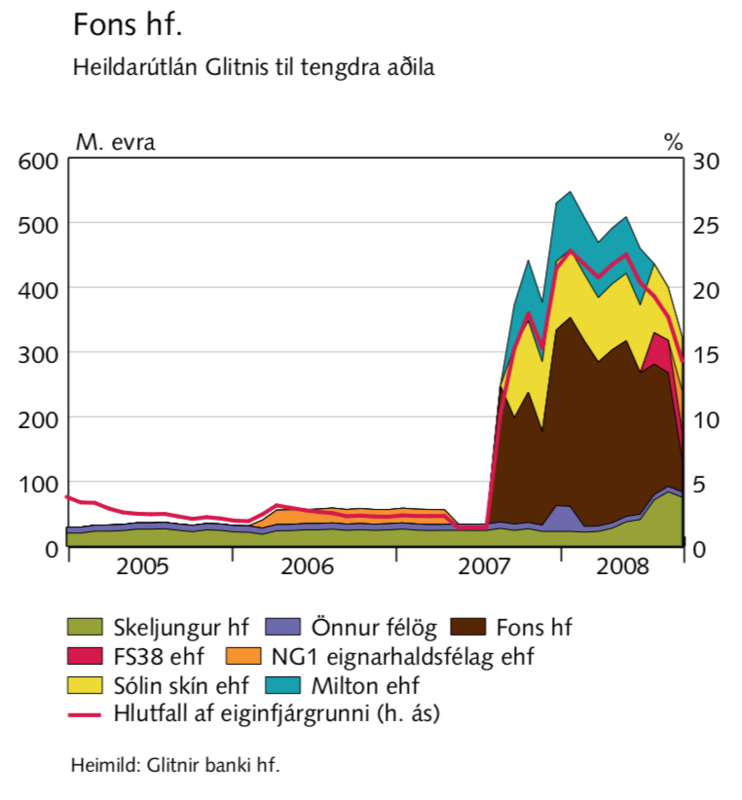 The lending related to Fons/Haraldsson is particularly striking since Haraldsson was part of the consortium Jóhannesson led in spring of 2007 to buy around 40% of Glitnir: after the consortium bought Glitnir, the lending to Haraldsson shot up like an unassailable rock. The common thread in so many of the SIC stories was how favoured clients – and in some cases bank managers themselves – were time and again wholly exempt from risk. One striking example is an email (emphasis mine), sent by Ármann Þorvaldsson and Kaupthing Luxembourg manager Magnús Guðundsson, jokingly calling themselves “associations of loyal CEOs,” to Kaupthing’s chairman Sigurður Einarsson and CEO Hreiðar Sigurðsson. This set-up, where the borrower is risk-free and the bank shoulders all the risk, has lead to several cases where bankers being sentenced for breach of fiduciary duty, i.e. lending in such a way that it was from the beginning clear that losses would land with the bank. (Three of these Kaupthing bankers, Guðmundsson, Einarsson and Sigurðsson, not Þorvaldsson, have been charged and sentenced in more than one criminal case). Due to measures taken in October 2008 in the UK against the Icelandic banks, there was a strong sense in Iceland that the Icelandic banks had collapsed because of British action. The use of anti-terrorism legislation by the British government against Landsbanki greatly contributed to these sentiments. A small nation, far away from other countries, Icelanders have a strong sense of “us” and “the others.” This no doubt exacerbated the understanding in Iceland around the banking collapse that if it hadn’t been for evil-meaning foreigners, hell-bent on teaching Iceland a lesson, all would have been fine with the banks. Some leading bankers and large shareholders were of the opinion that Icelanders had been such brilliant bankers and businessmen that they had aroused envy abroad: British action was a punishment for being better than foreign competitors (yes, seriously; see for example Þorvaldsson’s book “Frozen Assets”). The story told in the SIC report showed convincingly and in great detail how wrong all of this was: the banks had dug their own grave. Icelandic politicians and civil servants had tried their best to fool foreign countries and institutions how things stood in Iceland. Yes, the turmoil in international markets toppled the Icelandic banks but they were weak due to bad governance, great pressure by the largest shareholders and then weak infrastructure in Iceland, as I pointed out in a blog following the publication of the SIC report. This understanding is at times heard in Iceland but the convincing and well-documented story told in the SIC report has slowly all but eradicated this view. Some, but by far not all, of the dubious deals recounted in the SIC report have ended up in court. The SIC brought a substantial amount of cases deemed suspicious to the attention of the Office of Special Prosecutor, incidentally set up by law in December 2008. However, most if not all of these cases had also been spotted by the FME, which passed them on to the Special Prosecutors. CEOs and managers in all three banks have been sentenced in extensive market manipulation cases – the bankers were shown to have directed staff to sell and buy shares in a pattern indicating planned market manipulation. In addition, there have been cases involving shareholders, most notably the so-called al Thani case (incidentally strikingly similar to the SFO case against four Barclays bankers) where Ólafur Ólafsson, Kaupthing’s second largest shareholder, was sentenced to 5 1/2 years in prison, together with the bank’s top management. In total, close to thirty bankers and major shareholders have been sentenced in cases related to the old banks, the heaviest sentence being six years. The cases have in some instances thrown an interesting light on operations of international banks, such as the CLN case on Deutsche Bank. The SIC’s remit was inter alia to point out negligence by civil servants and politicians. It concluded that the Director General of the FME Jónas Fr. Jónsson and the three Governors of the CBI, Davíð Oddsson, Eiríkur Guðnason and Ingimundur Friðriksson, had shown negligence as defined in the law “in the course of particular work during the administration of laws and rules on financial activities, and monitoring thereof.” – None of them was longer in office when the report was published in April 2010 and no action was taken against them. It is for Alþingi to decide on action regarding ministerial failings. After a long deliberation, Alþingi voted to bring only ex-PM Geir Haarde to court. According to Icelandic law a minister has to be tried by a specially convened court, which ruled in April 2012 that the minister was guilty of only one charge but no sentence was given (see here for some blogs on the Haarde case). Geir Haarde brought his case to the European Court of Human Rights but the judgment went against him. Haarde is now the Icelandic ambassador in Washington. In hindsight, the SIC was given too short a time. With some months more, the role of auditors in the collapse could for example have been covered in greater detail. It is quite clear that the auditing was far too creative and far too wishful, to say the very least. The relationship between the banks and the four large international auditors, who also operate in Iceland, was far too cosy bordering on the incestuous. The largest gap in the SIC collapse story stems from the fact that the SIC had little access to the banks foreign operations. Greater access would not necessarily have altered the grand narrative. But court cases have shown that some of the banks’ criminal activities, were hidden abroad, notably in the case of Kaupthing Luxembourg. – As I have time and again pointed out, it is incomprehensible that authorities in Luxembourg have not done a better job of investigating the banking sector in Luxembourg. The Icelandic cases are a stern reminder of this utter failure. As mentioned above, only excerpts of the report were translated into English. To my mind, this was a big error and extremely short-sighted. Many of the stories in the report involve foreign banks and foreign clients of the Icelandic banks. The detailed account of what happened in Iceland throws light on not only what was going on in Iceland but also in other countries where the banks operated. The excerpts are certainly better than nothing but by far not enough – publishing the whole report in English would have done this work greater justice and been extremely useful in a foreign context. It is now just over eight years since the publication of the SIC report. Whenever something related to the collapse is discussed the report is a constant source and the last verdict. The report established a narrative, based on extensive sources, both verbal and written. Some of those mentioned in the report did not agree with everything in the report. When they sent in their own reports these have been published on-line. However, undocumented statements amount to little compared to the report’s findings. Its narrative and conclusions can’t be dismissed without solid and substantiated arguments to counter its well-documented conclusions. This means the story of the 2008 banking collapse cannot easily be reshaped. This is important because changing the story would mean undermining its conclusions and lessons to be learnt. In a recent speech, Tory MP Tom Tugendhat mentioned the UK financial crisis as the “forces of globalisation.” These would be the same forces that caused the collapse of the Icelandic banks – but from the SIC report Icelanders know full well that this is far too imprecise a description: the banks, both in the UK and Iceland, collapsed due to lack of supervision and public and political scrutiny, following year of lax policies. In order to learn from the financial crisis, countries need to know why there was a crisis – with no thorough analysis no lessons can be learnt. Also, not only in Iceland was criminality part of the crisis. Though not a criminal investigation, many of these stories surfaced in the SIC report, another important aspect. Greece, Cyprus, UK, Ireland, US – five countries shaken and upset by overstretched banks, which needed to be bailed out at great expense and pain to taxpayers. However, all of these countries have kept their citizens in the dark as to what happened apart from some tentative and wholly inadequate attempts. The effect of hiding how policies and actions of individuals, in politics, banking etc, caused the calamities has partly been the gnawing discontent and lack of trust, i.a. visible in Brexit and the election of Donald Trump as US president. Although Iceland enjoyed a speedy recovery (Icelog Sept. 2015), I’m not sure there are any particular economic lessons to be learned from Iceland. There were no magic solutions in Iceland. What contributed to a relatively speedy recovery was the sound state of the economy before the crisis, classic but unavoidably painful economic measures, some prescribed by the IMF, in 2008 and the following years – and some luck. If there is however one lesson to learn it is the importance of a thorough analysis of the causes of the crisis. The SIC was, and still is, a shiny example of thorough investigative work following a major financial crisis, also for other countries. It did not alleviate anger; anger is still lingering in Iceland. An investigative report is not a panacea, nothing is, but it is essential to establish what happened and why, with names named. There are never any mystical “forces” or laws of nature behind financial crisis and collapse. They are caused by a combination of human actions, which can all be analysed and understood. Without analysis and investigations it is easy to tell the wrong story, ignore the causes, ignore responsibility – and ultimately, ignore the lessons. This is the second blog in “Ten years later” – series on Iceland ten years after the 2008 financial collapse, running until the end of this year. What is Deutsche Bank hiding in Iceland? Deutsche Bank has studiously tried to hide some transactions with Kaupthing in 2008 – and in December 2016 probably thought it had succeeded when it agreed to settle for €425m to Kaupthing and two now bankrupt BVI companies set up in 2008 by Kaupthing. The story behind these deals figured in two Icelandic court cases and one of them, the so-called CLN case, has now taken an unexpected turn: the Supreme Court has ordered the Reykjavík Country Court to scrutinise the transactions as it reopens the CLN case. But what is Deutsche Bank hiding? “It’s not unlikely that an international bank wants to avoid being accused of market manipulation,” said Prosecutor Björn Þorvaldsson in Reykjavík District Court on October 11. In early 2008 Kaupthing managers were rightly worried about the sky-rocketing credit default swap, CDS, spreads on the bank; in spring of 2008 the spreads had crept up to 900 points, a wholly unsustainable rate for any bank. According to multiple sources over the years, Deutsche Bank came up with a simple plan: Kaupthing should buy CDS on itself linked to credit linked notes, CLNs, Deutsche Bank would issue. Except Kaupthing should not be seen doing it: finance it, yes – but through two BVI companies owned by trusted clients in deals set up by Deutsche Bank. Thus, the market manipulation was neatly out of sight. Only later did it transpire that Deutsche Bank was not only the broker in deals it knew were set up to manipulate the market – hence the remark by Prosecutor Björn Þorvaldsson – but it was actually on the other side of the CDS bets, a player in that market. Consequently, the bank profited handsomely, both from fees and from the actual CDS deals. In the Deutsche Bank universe this unglorious saga of transactions to manipulate the market etc is however not at all true. Yes, Deutsche Bank admits it was the broker but it knew nothing of the purpose of the transactions, had no idea Kaupthing did finance the two BVI companies and certainly was not on the other side of the bets. This is what Deutsche Bank has stated in a London court and in witness statements in criminal proceedings Iceland (where Deutsche Bank is not being charged). However, outside of the Deutsche Bank universe (and well, probably in some hidden corners inside Deutsche given the email trail that has surfaced in Icelandic court) there is abundant evidence showing the Deutsche Bank involvement. Certainly, Icelandic prosecutors are in no doubt Deutsche Bank was involved in the planning, knew of the Kaupthing funding and made money from the funds. Kaupthing had poured €510m into the CDS bets. Early on, the administrators of Kaupthing and the two BVI companies eyed an interesting opportunity to claw these funds back. Until December last year, the administrators, in separate actions, have been suing Deutsche Bank in various places over these transactions. When the legal fights were about to come up in court Deutsche Bank relinquished: to avoid having the whole well-documented saga exposed in court, with evidence running counter to the Deutsche Bank version of the CDS saga, Deutsche Bank finally agreed to pay €425m, around 85% of the millions that went through Deutsche Bank into the CDS schemes. Intriguingly, in 2010 the Serious Fraud Office, SFO, had its eyes on Deutsche Bank’s CDS transactions with Kaupthing but this case seems to have evaporated as so many of the suspicious deeds in UK banks. The story of these CDS transactions is a central part in the still on-going so-called CLN case. Kaupthing bankers have been charged for fraudulent lending and breach of fiduciary. Below, the focus is on the role of Deutsche Bank in the CDS transactions – what its real role was and why Deutsche Bank was in the end so keen to settle when nothing in the original 2008 agreements obliged it to pay anything back. In June 2012, Kaupthing hf, an Icelandic stock corporation, acting through its winding-up committee, issued Icelandic law claw back claims for approximately € 509 million (plus costs, as well as interest calculated on a damages rate basis and a late payment rate basis) against Deutsche Bank in both Iceland and England. The claims were in relation to leveraged credit linked notes (“CLNs”), referencing Kaupthing, issued by Deutsche Bank to two British Virgin Island special purpose vehicles (“SPVs”) in 2008. The SPVs were ultimately owned by high net worth individuals. Kaupthing claimed to have funded the SPVs and alleged that Deutsche Bank was or should have been aware that Kaupthing itself was economically exposed in the transactions. Kaupthing claimed that the transactions were voidable by Kaupthing on a number of alternative grounds, including the ground that the transactions were improper because one of the alleged purposes of the transactions was to allow Kaupthing to influence the market in its own CDS (credit default swap) spreads and thereby its listed bonds. Additionally, in November 2012, an English law claim (with allegations similar to those featured in the Icelandic law claims) was commenced by Kaupthing against Deutsche Bank in London (together with the Icelandic proceedings, the “Kaupthing Proceedings”). Deutsche Bank filed a defense in the Icelandic proceedings in late February 2013. In February 2014, proceedings in England were stayed pending final determination of the Icelandic proceedings. Additionally, in December 2014, the SPVs and their joint liquidators served Deutsche Bank with substantively similar claims arising out of the CLN transactions against Deutsche Bank and other defendants in England (the “SPV Proceedings”). The SPVs claimed approximately € 509 million (plus costs, as well as interest), although the amount of that interest claim was less than in Iceland. Deutsche Bank has now reached a settlement of the Kaupthing and SPV Proceedings which has been paid in the first quarter of 2017. The settlement amount is already fully reflected in existing litigation reserves and no additional provisions have been taken for this settlement. (Emphasis here and below is mine). This is Deutsche Bank’s very brief story of the CNL saga and the settlement in the bank’s 2016 Annual Report. – Not admitting anything and yet, for no reason at all judging from the Annual Report, it paid Kaupthing an undisclosed sum, now known to be €425m. As recounted in an earlier Icelog there were rumours soon after the October 2008 banking collapse that Kaupthing had funded transactions connected to the bank’s CDS in order to manipulate the spread, thus lowering the bank’s ominously high financing cost. At the end of January 2009 former chairman of the Kaupthing board Sigurður Einarsson told his side of the various stories swirling in the media. Yes, it was true that Kaupthing had funded transactions by what he called Kaupthing’s “trusted clients” to influence the bank’s CDS spread but it had done so on advice from Deutsche Bank. Kaupthing set up two BVI companies, Chesterfield and Partridge, for the sole purpose of carrying out the CDS transactions. Chesterfield was owned by three companies, in turn owned by four Kaupthing clients: Antonios Yerolemou, Skúli Þorvaldsson and the fashion entrepreneurs Karen Millen and Kevin Stanford, respectively owning 32 %, 36% and 32%. The Icelandic businessman Ólafur Ólafsson owned Partridge, also through another company. Kaupthing lent funds to the four companies owning the two BVI companies that acted in the CDS transactions – all the companies were in-house with Kaupthing, which carried out all the transactions. The beneficial owners were only asked for consent to begin with but were not involved in the transactions themselves. All of the owners were, as Einarsson said in his letter, longstanding and “trusted clients” of Kaupthing. In 2001, Yerolemou, a Cypriot businessman prominent in the UK Cypriot community and a Conservative donor, had sold his business, Katsouris, to Exista, Kaupthing’s largest shareholder and stayed close to Kaupthing, also briefly as its board member. Stanford had a long-standing relationship with Kaupthing as with the other Icelandic banks and Ólafsson was the bank’s second largest shareholder. “At the beginning of 2008, Kaupthing sought advice from Deutsche Bank as to how it could influence its CDS spreads. In a presentation in early February, Deutsche Bank advised Kaupthing, for instance, to spend all liquid funds it received to buy back its own short-term bonds in an attempt to normalise the CDS curve. In the summer the idea of a credit-linked note transaction appeared in an email communication from an employee of Deutsche Bank. It states that this would mean a direct impact on the CDS spreads rather than an indirect one, as in the case of buy backs of own notes. It also states that this transaction will be financed. The message concludes by stating that the issue has to be timed right to get the ‘most “bang” for the buck’. In e-mail messages exchanged by Sigurdur Einarsson and Hreidar Mar Sigurdsson following this, the two agree that they do not need to involve pension funds, but that there is ‘no question’ that they should do this. According to the SIC the CLN transactions “can be assumed to have actually made an impact on the CDS spreads on Kaupthing.” The SIC report came up with the total amount lost by Kaupthing on these trades: €510m, all of which had been paid to Deutsche Bank as the broker of the underlying deals. Further information came up in a London Court in 2012: soon after Kaupthing failed, Partridge and Chesterfield unavoidably went bankrupt; after all, their only assets were the CLN linked to the failed CDS bet. Their administrators, Stephen Akers from Grant Thornton London and his colleague, quickly turned to Deutsche Bank to get answers to some impertinent questions regarding the two companies. When Deutsche Bank was not forthcoming Akers took a legal action demanding from Deutsche Bank documents related to the transactions. A decision was reached in February 2012. In his affidavit in the 2012 Decision, Akers said: “It is very difficult to see how the transactions made commercial sense for the Companies. This request for information is in part to explore how the Companies might have expected to benefit from the transactions, to identify what the Companies’ purposes and objectives in entering into the transactions were and how the Companies were expected to repay the loans from Kaupthing if there was movement in the market in the ‘wrong’ direction (as transpired). … The Joint Liquidators are keen to understand, through requests for information and documents from key parties, why these particular transactions were entered into by these particular companies. DB was right that the CLNs were not in any way unusual – but the CLNs per se were not the problem that drove Akers to collect information but the whole transactions. However, there is abundant documentation, inter alia emails to and from Deutsche Bank etc. to show that Deutsche Bank was indeed aware that Kaupthing was financing the two companies’ bet on the Kaupthing CDS. And Deutsche Bank definitely advised Kaupthing in this set up, again born out by emails. Vishwanathan’s interpretation runs contrary to what Akers claimed and other sources support: that the transactions were set up for Kaupthing, via the two companies, in order to influence the market. DB placed Wishwanatahn on leave in 2015, in autumn 2016 he had sued the bank for unfair dismissal. According to his LinkedIn profile, Wishwanathan now lives in Mumbai (he has not responded to my messages). In 2014, Sigurður Einarsson, Kaupthing’s CEO Hreiðar Már Sigurðsson and head of Kaupthing Luxembourg Magnús Guðmundsson were charged of breach of fiduciary duty and fraudulent lending to the two BVI companies, Partridge and Chesterfield, causing a loss of €510m to Kaupthing. The charges (in Icelandic) support and expand the earlier evidence of Deutsche Bank role in the CDS trades. Deutsche Bank made for example no attempt to be in contact with the Kaupthing clients who at least on paper were the owners of the two companies. Deutsche Bank was solely in touch with Kaupthing. When the two companies needed for example to meet margin calls its owners were not averted; Deutsche Bank sent all claims directly to Kaupthing, apparently knowing full where the funding was coming from and who needed to make the necessary decisions. But who was on the other side of the CDS bets, who gained in the end when the Kaupthing-funded companies lost so miserably? DB fees amounted to €30m for the total CDS transactions of €510m. The oral hearings in the CLN case were in Reykjavík in December last year. I attended the hearings, which further not only supported the story of Deutsche Bank’s involvement but provided ample tangible evidence as witnesses were questioned and emails and other documents projected on a screen. A short chapter in the CDS saga is the fact, already exposed in the SIC report, that Kaupthing had indeed planned with Deutsche Bank to set up yet another company to trade on Kaupthing’s CDS. Kaupthing issued a loan of $50m to Brooks Trading Ltd, via another company called Mink Trading, both owned by Sheikh Mohamed Khalifa al Thani. The purpose was to invest in CLN linked to Kaupthing’s CDS, via Deutsche Bank, identically structured as the CDS transactions through Chesterfield and Partridge. CDS transactions through Brooks were however never carried out. Sheikh al Thani played a role in another Kaupthing case, the so-called al Thani case; the Sheikh was not charged but the three Kaupthing managers, charged in the CLN case, and Ólafur Ólafsson were sentenced to three to 5 ½ years in prison. The bankers for fraudulent lending, breach of fiduciary duty and market manipulation; Ólafsson was sentenced for market manipulation. The evidence brought out in the CLN case – the tracing of the transactions, emails, phone calls etc. – shows that the Kaupthing managers were extremely focused on exactly these transactions. Kaupthing was teetering and yet they never wavered from paying to Deutsche Bank, the agreed sums and the margin calls that followed. It almost seemed as if nothing else mattered in their world, a sense further strengthened by some back-dated documents related to the CDS transactions. The last payments were made just as the bank was collapsing, 7 October 2008; the bank went into administration 8 October. During these last weeks, foreign currency was scarce at the bank in Iceland where the payments originated. On 6 October, prime minister Geir Haarde addressed the stunned nation on radio and television at 4pm, to announce the Emergency Act enabling Icelandic authorities to deal with collapsing banks in an orderly manner. – Hreiðar Már Sigurðsson, then CEO of Kaupthing but only for 48 more hours, has said in court that when he heard of the Emergency Act he knew it was over for the banks. At noon of 6 October, Geir Haarde and the governor of the Central Bank, CBI, Davíð Oddsson, who both knew the Emergency Act was coming later that day, agreed the very last lending to the banks: Kaupthing would be given a loan of €500m. This, to permit Kaupthing to meet payments the Bank of England and the FSA were demanding as a guarantee for the bank’s UK subsidiary, Kaupthing Singer & Friedlander. The reasons for this loan have never been completely clarified (see Icelog on this story): documents and an audio of the phone call between Oddson and Haarde remains classified in spite of valiant attempt by the Icelandic media to unearth this evidence. The CBI has promised a report on the Kaupthing loan “soon” but so far without a publication date. Whatever the motivation, the CBI issued the loan directly to Kaupthing without securing it would be used as promised, i.e. to strengthen Kaupthing’s UK subsidiary. Instead, part of it was used 7 October when Kaupthing paid, via the two BVI companies, the last €50m CDS transactions to Deutsche Bank. This is how much the CDS transactions mattered to the Kaupthing managers who never, not even in the mid of the cataclysmic events engulfing the bank these early days in October 2008, took their eyes off the CDS transactions with Deutsche Bank. In January 2016, the Reykjavík District Court acquitted the three Kaupthing managers of the fraudulent lending and breach of fiduciary duty they had been charged with in the CLN case. In February this year, the Office of the Special Prosecutor (now Office of the District Prosecutor, encompassing the earlier OSP and other duties), appealed that decision to the Supreme Court. In March 2016, I reported on Rúv (in Icelandic) that Deutsche Bank had indeed come to an agreement with Kaupthing: on-going legal cases, mentioned in Deutsche Bank’s annual reports 2015 and 2016 (but not in earlier reports), had now been settled with Deutsche Bank agreeing to pay Kaupthing more than €400m. The agreement had been sealed in December 2016. Kaupthing made no big deal of the millions accruing from Deutsche Bank – no press release, just silence. I pointed out that what Deutsche Bank had stated in the 2012 court case in London was not in accordance with other sources. Also that the bank had mentioned the Kaupthing claims in its 2015 Annual Report but stated it had filed defence and continued to defend them. I concluded that Deutsche Bank 1) refuted it knowingly participated in transactions knowing set up to mislead the market 2) refuted that Deutsche Bank planned the transactions 3) denied knowing Kaupthing was itself financing the transactions aimed at lowering its CDS spreads. Further, I pointed out that statements from the Prosecutor in the CLN case showed that Deutsche Bank was not only the broker in these transactions but was actually on the other side of the bet it set up for Kaupthing and gained handsomely when Kaupthing failed. In my email exchange with Deutsche Bank I mentioned that this matter had wider implications – Deutsche Bank has stated in court and in its annual reports that it had nothing to do with the CDS trades except selling the CLN related to it. Thus, it could be argued that the stance taken by Deutsche Bank, compared to abundant evidence, has been misleading and that has much wider implications than just being a matter between Deutsche Bank and Kaupthing. – The answer was, as before: settlement reached, no further comments. It’s interesting to note that at the time Deutsche Bank reached an agreement of paying €425m to Kaupthing it was struggling to reached its required capital level, looking for €8bn. That did allegedly force the bank to finish several outstanding cases, the Kaupthing case being one of them. Why did Deutsche Bank change its mind and meet 85% of the Kaupthing claims? Following my March reporting on the agreement between Deutsche Bank and Kaupthing where Kaupthing did indeed recover around 85% of its CDS transactions with Deutsche Bank the three Kaupthing managers charged in the CLN case, now fighting an appeal by the Prosecutor, turned to the Supreme Court asking for the case to be dismissed: according to them, the basis of the claims had been the €510m loss to Kaupthing – and now that there was apparently hardly any loss the case should be dismissed. Their demand for dismissal came up at the Supreme Court 11 October where the Court stipulated that in order to understand the demand for dismissal the Court needed to get a deeper understanding of the Deutsche Bank agreement with Kaupthing. The District Prosecutor had obtained a copy of the agreement handed to the Court but not made public in its entirety. During the oral hearings that day Prosecutor Björn Þorvaldsson maintained that the agreement did not change the charges in the CLN case to any substantial degree: the loans had been illegal, no matter if the money was then much later clawed back. He said that according to the agreements in 2008, Deutsche Bank had been entitled to the funds and Kaupthing had no claim for clawing them back. So what did then change, why did Deutsche Bank decide to meet the Kaupthing claims and pay back €425m of the original €510m it got from the CDS transactions? The Prosecutor said one could only guess: 1) Perhaps Deutsche Bank wanted to hide that the Kaupthing loans to the two companies did indeed end up with Deutsche Bank 2) Did Deutsche Bank see it as harmful to the bank’s reputation that the details of the transactions would be exposed in a court case? 3) Was it accusation of being part of market manipulation that irked Deutsche Bank? The Supreme Court decided on the dismissal request 19 October. According to the Decision, Deutsche Bank signed two agreements in December 2016 regarding the 2008 CDS transactions. One was an agreement with the two companies involved, Chesterfield and Partridge. The other one is with Kaupthing. The aim was to effectively end three court cases where Kaupthing was suing Deutsche Bank in addition to cases brought by the two companies against Deutsche Bank. According to the agreement the two companies and Kaupthing agreed to put an end to their legal proceedings against Deutsche Bank – and Deutsche Bank concurred to pay €212.500.000 to Kaupthing and the same amount to the two companies, in total €425m. Further, the agreement stipulated that Kaupthing (as the largest creditor of the two companies) would get 90% of the Deutsche Bank payment to the two companies. In total, Deutsche Bank paid €425m to end all dispute, whereof over €400m would go to Kaupthing. The thrust of the arguments, on one side the Prosecutor, on the other side the three defending bankers was that the Prosecutor said that issuing the loans was the criminal deed, that’s what the three were being charged for – whereas the three defendants claimed that since Deutsche had now paid most of the transactions back it showed that the bank felt legally obliged to pay on the basis of the 2008 contracts. In its Decision the Supreme Court scrutinised the final settlement of the CDS transactions concluded at end of October 2008, which indicated that Deutsche Bank did indeed not feel obliged to pay anything back to the owners of the CLNs. Same when Icelandic police interrogated two (unnamed) Deutsche employees: nothing that indicated Deutsche Bank thought it was obliged to pay anything back. The Supreme Court concluded that based on the information at hand on the December 2016 settlement it was neither clear “why the bank (DB) agreed to issuing these payments, what the arguments were nor what material was the basis for the claims by Kaupthing and the two companies in their legal actions against Deutsche Bank. It is also not clear what was the nature of the (December 2016) payments, if they related to earlier contracts (i.e. the 2008 contracts) or if they were damages and if they were damages then what was their nature. Based on this, the Supreme Court then decided against dismissal, as demanded by the three bankers, sending the case back to the Reykjavík District Court for a retrial where questions regarding the December 2016 settlement should be clarified in addition to the charges brought by the District Prosecutor. This means that although Deutsche Bank settled with Kaupthing and the two companies the actions of Deutsche Bank will be scrutinised by Icelandic Court, probably already next year. In April 2015 Deutsche Bank settled LIBOR manipulation cases with US authorities, paying $2.175bn and £226.8m to the UK Financial Conduct Authority, FCA as mentioned in the bank’s 2015 Annual Report. In January this year it paid £163m to the FCA, the largest fine ever paid to the FCA, for “serious anti money-laundering controls falings” in the so-called mirror trades, where $10bn were sent out of Russia to offshore accounts “in a manner that is highly suggestive of financial crime.” At the same time, US authorities fined the bank $425m for the same offense, pointing out that “Deutsche Bank and several of its senior managers missed key opportunities to detect, intercept and investigate a long-running mirror-trading scheme facilitated by its Moscow branch and involving New York and London branches.” – Many years ago, a source said to me Deutsche Bank really should be called Russische Bank. In additions, there have been fines for violating US sanctions. Lastly, there is focus on Deutsche Bank and its tight connection to US president Donald Trump. And so on and so forth. In this context it is interesting that Deutsche Bank has decided to pay €425m to Kaupthing, a high sum in any context, even in the context of fines Deutsche Bank has had to pay over the years. From all of these various sources it is easy to conclude as did the State Prosecutor in October that yes, one reason why Deutsche Bank would want to bury it involvement in Kaupthing’s CDS trades in the summer of 2008 is that this looks like a market manipulation by a major international bank. Further, Deutsche Bank has questions to answer regarding its own involvement in the market, i.e. it did not only broker the CDS deals, knowing full well who financed the two BVI companies, but it was actually a player in that market, making a lot more from the deal than only the fees. Updated 14.6.2018: a retrial has been ordered, the case will come up next winter. This time, there will also be some focus on DB’s role in order to understand the context better though neither DB nor any DB bankers are charged. Yet another case from the Office of Special Prosecutor v Kaupthing’s three top managers is up in Reykjavík District Court these days. As in several other cases, the charges centre on breach of fiduciary duty, ultimately causing the bank a loss of €510m. The loans went to two companies owned by Kaupthing clients that used the funds to buy credit linked notes and enter into credit default swaps related to Kaupthing in order to lower the bank’s collateral debt swap spread. Does this sound like market manipulation? Deutsche Bank seems to think it might, strongly denying any involvement in the scheme except as the issuer of the notes though Icelandic sources tell a different story. * – But who made a killing on the other side of the CDS bet? Partly Deutsche Bank, according to the OSP but this part of the CLN saga is still not entirely clear, which is one of the reasons why the court hearings might be interesting. Soon after the collapse of the three largest Icelandic banks in early October 2008 there were plenty of allegations, also in the Icelandic media, of possible wrongdoing in the banks. One of the stories told centred on Kaupthing funding transactions connected to the bank’s CDS. At the end of January 2009 former chairman of the Kaupthing board Sigurður Einarsson wrote a letter to friends and relatives explaining his side of the media reports. The first matter he dealt with was the CDS story: it was true that Kaupthing had funded transactions by what he called “trusted clients” of the bank to influence the bank’s CDS spread, following a proposal from Deutsche Bank, DB. This story was told in greater detail in the 2010 report by the Icelandic Special Investigations Committee, SIC: also here, the idea is said to have originated with DB. Further information came up in a London Court in 2012: the two BVI companies set up for the transactions, Partridge and Chesterfield, went bankrupt soon after Kaupthing failed. Their administrators, Stephen Akers from Grant Thornton London and a colleague, quickly turned to DB to get answers to some impertinent questions regarding the two companies. Now, the CDS saga is summed up in the OSP charges (in Icelandic) against Einarsson, Kaupthing’s CEO Hreiðar Már Sigurðsson and head of the bank’s Luxembourg operations Magnús Guðmundsson in a case of breach of fiduciary duty and causing a loss of €510m to Kaupthing, some of it paid out on Kaupthing’s last day of trading. In orchestrating the loans the three managers took great care that DB would get paid, i.e. the deal would not fall through due to lack of funds at a time when Kaupthing had practically no foreign currency left and was running out of liquidity. According to the charges DB not only organised the transactions but also took part of the opposite bet. What is still lacking in this saga is who, together with DB, was on the other side of the bet the two companies lost? In his letter to friends and family 26 January 2009 Einarsson pointed out that although the UK Financial Services Authority, FSA, had in the third week of August 2008, ascertained that Kaupthing’s UK operation, Kaupthing Singer & Friedlander, KSF, was well funded the CDS spread on Kaupthing stayed high. Unreasonably so according to Einarsson who claimed having heard from foreign journalist that false rumours on Kaupthing were being spread, even by PR firms. There were also rumours, wrote Einarsson, that the CDS market was being manipulated, not only in relation to Iceland. (The letter was later leaked to the Icelandic media, see here, in Icelandic; excerpts below, my translation). Following Lehman’s collapse September 15 2008 the CDS spread on Kaupthing increased; not only Kaupthing but the international banking system felt under siege, wrote Einarsson. This had been the rational behind these transactions, wrote Einarsson, made to maintain Kaupthing as a going concern contrary to media reports that funds had been taken out of the bank before it collapsed. One of the many interesting stories in the SIC report was the story of the Kaupthing transactions regarding the CLNs. Two BVI companies, Chesterfield and Partridge, were set up by Kaupthing. The former was owned by three companies under the ownership of Antonios Yerolemou, Skúli Þorvaldsson and Karen Millen and Kevin Stanford, respectively owning 32 %, 36% and 32%. Ólafur Ólafsson owned the latter, through another company. All of the owners were, as Einarsson said in his letter, longstanding clients of Kaupthing. Yerolemou, a Cypriot businessman prominent in the UK Cypriot community and a Conservative donor, had sold his business, Katsouris, to Exista, Kaupthing’s largest shareholder, in 2001 and stayed in touch, i.a. as a board member of Kaupthing in 2007. Stanford had a long-standing relationship with Kaupthing as with the other Icelandic banks and Ólafsson was the bank’s second largest shareholder. Stephen John Akers works at Grant Thornton in London and has a fearsome reputation as a diligent administrator. On being appointed a liquidator in 2010 of the two BVI companies, Chesterfield and Partridge, together with his colleague Mark McDonald, the two quickly set about to understand the nature of the transactions in the two companies. They turned to DB with two impertinent key questions: 1) How did the transactions make commercial sense for the two companies? 2) How were the two companies expected to repay the loans from Kaupthing in case the markets moved against them, as indeed did happen? When answers were not forthcoming from DB Akers sued the bank to get access to documents related to the transactions. In February 2012 a judge ruled DB should hand over the information asked for. As to the purpose of the companies Akers states in his affidavit that “it seems possible that the Companies were involved in a wider package or scheme, although it is too early to comment definitively on the purpose of such scheme, contemporaneous reports and documents suggest that the purpose might have been to manipulate the credit market for Kaupthing” (Emphasis mine). Thus, Vishwanathan claims the email was not referring to Kaupthing getting the timing right for the most bang but the two companies investing in the CLN. According to the charges the first round of loans was made end of August 2008 to the three companies funding Chesterfield, in total €130m. However, these late August loans were issued so the companies could repay an earlier money market loan from Kaupthing Luxembourg, which already in early August had been used to instigate the transaction organised by DB in return for CLN as the company entered into a CDS with DB on Kaupthing; €125m were used on the CLN transaction but DB got €5m in fees. In September 2008 Kaupthing issued further loans of €125m to Chesterfield to meet margin calls from DB. The Partride loans were issued in September, first €130m, of which €125m were used on the same kind of CLN transactions as Chesterfield though with the difference that DB only got a fee of €3.625.000 with apparently the rest, €1.375.000 left behind in Ólafsson’s company (the charges do not clarify why or for what purpose these funds were left in Ólafsson’s company or why DB settled for a lower fee than on the other transaction for the same amount). Also here there were margin calls from DB, for which Partridge got a further loan of €125m. In total, Kaupthing lost €510m on these transactions. As Akers pointed out this loss was entirely predictable if the market turned and Kaupthing went out of business – after all, the two companies were unhedged. In other words, the two companies had little or no assets beyond the CLNs meaning that it was, according to the OSP, clear from the beginning that the companies should never have received the loans they got. The charged Kaupthing managers steered the operations of the two companies and followed closely that the loans were paid to DB. According to emails between Sigurðsson and Einarsson as the scheme was being planned, quoted in the SIC report, the two seemed to have at first planned to ask some pension funds to participate but instead opted for the trusted clients. The two were adamant that payments should go through to DB no matter what. In one instance, payment was due on 2 October 2008 but the managers made sure it was paid already on 22 September. The most remarkable part of these loans is that they were being paid to DB literally up to the last hours of Kaupthing. Almost the only un-told saga (my account of this is here) from these last days relates to a rather incomprehensible loan of €500m given to Kaupthing by the CBI at noon on October 6 2008, hours before prime minister Haarde addressed the stunned nation to spell out the catastrophe in view: the banks could all fail, necessitating Emergency Law. The CBI loan was given, as far as is known, to meet demands by the FSA for funds to strengthen KSF: the funds were ear-marked to prevent the failure of KSF in order to prevent cross-defaults, which would bring down the mother-bank in Iceland. However, nothing indicates the funds were used for that purpose and the CBI does not seem to have made any safeguards as to how the loan would be used. Sigurðsson has later said that the Kaupthing management was unaware of the imminent Emergency Law as the loan was issued; as soon as he was aware of the Law, later in the afternoon, he knew the banks would not survive. Yet, next day October 7, €50m were paid to DB in connection with the CLNs transactions, which were based on the premises that Kaupthing would be a going concern in five years time. The OSP charges state that the CBI loan enabled this last payment to DB. – On October 8 the Kaupthing board resigned; the day after Kaupthing in Iceland was taken over by administrators. Further, the OSP charges show the loan documentation was lacking and the foreign owners were not entirely informed by Kaupthing of the transactions. Ólafsson says Sigurðsson asked him to participate; Sigurðsson claims Ólafsson or his representative asked for Ólafsson to be included. According to the charges, documents related to these loans were changed twice after Kaupthing went into administration, first a few days after the collapse and again in December 2008. Apart from this, the choice of clients to lend to was quite remarkably a direct challenge to complaints from the Luxembourg financial services authority, Commission de Surveillance du Secteur Financier, CSSF. In August 2008 the CSSF warned Kaupthing Luxembourg of the precarious position of some of its large debtors and shareholders. Choosing these clients for further loans was a direct challenge to the CSSF warnings, again a sign that the Kaupthing managers were willing to go to a great length to execute this plan. Did it make sense to try to influence the CDS via the CLN transactions? The Kaupthing managers claim lending to influence the CDS spread was an understandable attempt, given the situation at the time. As mentioned above the BVI administrators could not quite see the sense. Further, CDS spread is a measure of trust, the high spread indicated low trust. As it were, the transactions seemed to influence the spread for a few days. Considering the cost to Kaupthing and the risk, this was a high-wire act that resulted in losses and made absolutely no material difference to Kaupthing’s situation, except increasing the losses. Also, these transactions were invisible to the market – of course Kaupthing did not advertise it was itself going into the market to finance the CDS linked transactions. If found out, this would definitely not have looked good, having a negative influence on the trust-factor the bank was trying to influence. The large sums of money needed, the very little impact and the great risk might show the despair among the bank’s management. A sober scrutiny, also from the technical point of view, does not indicate this ever was a good idea. And then there is the market-manipulation angle DB contests. The result was that the bank lost €510m by setting up a trade with remarkable little influence on the bank’s CDS spread, which at the same time created a hell of a good deal for those on the other side of the bet. Who was on the other side of the bet? As referenced above DB denies all involvement in the CLNs transactions apart from issuing the CLNs. Yet, according to the charges DB was much more heavily involved. The Kaupthing managers assumed, according to the charges that DB would go into the market to find those willing to take the opposite position but, according to the charges, the managers did not do anything to inquire into the matter. As it turns out, according to the OSP charges, DB did indeed take part of the position for itself. It is however unclear if DB was the end beneficiary here or if it was possibly acting on behalf of clients. In the end, DB turned out to be one of the largest creditors in all the failed Icelandic banks. The interesting side saga looming in the coming court case is what role DB did play – and who made the handsome profit from the trades that caused Kaupthing such losses. *Obs: neither Deutsche Bank itself nor any DB employees are charged in the Icelandic case but the outcome in Iceland might have ramification for civil cases related to the scheme. The above is not based on accounts at the court case, but as stated above, mainly on Einarsson’s 2009 letter, the 2010 SIC report, the 2012 Aker ruling and lastly the OSP charges in the present case. I will be blogging in the coming days on what has transpired at the court case. – The CDS saga was one of the first cases related to the banking collapse that caught my attention so I’ve been following it for over six years. Last week, the Office of the Special Prosecutor initiated criminal proceedings against three Kaupthing managers for breach of fiduciary duty. The managers are Sigurður Einarsson formerly chairman of Kaupthing, its CEO Hreiðar Már Sigurðsson and Kaupthing Luxembourg managers Magnús Guðmundsson. At stake are loans to four companies, in total €510m, owned by Ólafur Ólafsson, the bank’s largest shareholder, Conservative party donor and at one time a Kaupthing board member Tony Yerolemou and two big clients of the bank, Kevin Stanford and his ex-wife Karen Millen. The loans were used to fund two companies, which traded in Kaupthing’s CDS, in order to encourage a fall in the CDS and reduce the bank’s financing cost. These CDS deals were done in cooperation with Deutsche Bank. None of the clients nor Deutsche are under investigation at the OSP in relation to this scheme. The loans were issued to BVI companies with little or no other assets than the financial assets, which were being funded. In some cases Kaupthing issued loans to these companies without the knowledge of their owners. According to the claims, the loans were not taken up in the bank’s credit committees nor were credit committees told of previous loans to these companies. Although there are higher sums at stake in two large market manipulation cases against Kaupthing and Landsbanki managers – cases that consist of actions stretching over some time, this latest case is the largest single case so far and is likely to remain so. So far, all the OSP cases relating to the collapse of the banks are stories already known from the SIC report, published in April 2010 and this CDS case is no exception. Five European sovereign bailouts, five ways of doing it – but one thing is common to them all: reckless lenders are spared (except in the last Greek round) and hedge funds rewarded. This time, even the smallest deposit holders are hit. One clear consequence: the European Union is rapidly losing support in its member states. Now, with the experience of five European bailouts it is safe to say they come in different sizes – from the Greek one now totalling €240 to the latest, €10bn for Cyprus. Apart from the Greek haircut (finally after two attempts to stabilise Greece) bondholders have not been touched. In Cyprus where 48% of public sector debt is held by domestic banks, a haircut à la grecque would have felled the banks and not been of much help. One particularity of the Cypriot banks is that although their assets are roughly eight times the island’s GDP they are mostly funded by deposits, not by whole-sale loans like i.a. the Icelandic banks were. After being badly hit by the Greek haircut last year – more like the last drop rather than the real reason for their troubles – equity in Cypriot banks has evaporated. Laiki Bank is a case in point: its assets and liabilities is €30.4bn, its equity paltry €1bn. By turning 10% of deposits into equity, as the stability (or more sweetly, solidarity) levy roughly does – bingo, the equity is miraculously a much more sustainable 8% and the troika doesn’t need to provide lending to save the banks. Assuming there will be any deposits left in the Cypriot banks when banking resumes after an, apparently, prolongued bank holiday later this coming week (the banks were due to open on Tuesday, after a long weekend, but there is now rumour they will not open until Wednesday or even later). By looting bank accounts the total sum needed is brought down: instead of a bailout sum of one Cypriot GDP, ca €17bn, “only” €10bn will be needed. This is a drastic measure. If this could solve the problem it might have some merit – it would be a quick stab instead of the lingering pain in Greece – but that is more than uncertain. I find it very difficult to stomach that there was not a minimum sum left untouched. Let us say a pensioner with €30.000 would have kept his savings unscathed. Or even holding a sum equivalent to the minimum deposit guarantee of €100.000 untouched but putting a levy of 15% on everything above that. Perhaps none of this would have sufficed to bring the total loan down but yes, I still find this measure extremely brutal and this measure needs to be strongly underpinned and justified. The FT (paywall) has an account on how the deal was reached – it will not make the Germans more popular and it is still incomprehensible how this part of the bailout packet could end where it did. It follows from the way Cypriot banks were funded that they have been stuffed with money, not from Cypriot pensioners and small savers but with Russian money and other foreign money hiding from attention. It has been known for a long time and what did the European Union or the ECB do about it? Not very much or at least nothing that drove this money away. Now, both Russian oligarchs and a Cypriot olive farmer are hit by the same measure. How fair is that? One frequently mentioned thing over the last months is if Cyprus should chose the Icelandic way in terms of deposit holders. This advice normally comes without any explanation as to what was done in Iceland and seems to imply that deposit holders should or could be treated differently according to nationality. However, what was done in Iceland can’t possibly apply to Cyprus. The deposits the Icelandic Government refrained from saving were deposits in Icelandic branches abroad, in reality so-called Icesave internet accounts in Landsbanki branches in the UK and the Netherlands. When deposits were moved into the new banks, where deposit holders could then access the funds previously held with the old banks, only deposits in Iceland were moved. – The Cypriot Government could not, on the basis of the Icelandic way, differentiate between, let us say foreign and Cypriot depositors in Cyprus. For the Cypriot Government, the problems relate to deposits in Cyprus, not abroad. Suggesting that the Cypriots follow the Icelandic course of action seems based on some ignorance about or misunderstanding of what was done in Iceland as the three banks collapsed in October 2008. Interestingly, I am told that Greek and the Cypriot officials did ask the European Commission informally if the Icesave judgement – where the Icelandic state was not deemed to be obliged to guarantee the Deposit Guarantee Fund nor was it seen to have discriminated against deposit holders abroad (because deposits in Iceland were moved to the new banks, without the use of the Icelandic DGF) – could be of any consequence, i.e. use for them. The answer was a succinct “no.” The EU and the ECB firmly believe that the sovereign is the last guarantor of the financial system in each country – and now, in one case, a state has been allowed to confiscate money from depositors, olive farmers and oligarchs alike. Cypriots are understandably furious – but the Cypriots, just like Icelanders some years ago, should be furious with their own politicians. There is little point in talking about neo-colonial powers. The EU, the ECB and the IMF have a say over the Cypriot economy because the way things were run in Cyprus. Being mired in debt – no matter if it is a person or a sovereign – leads to a loss of independence. That is the harsh and painful reality. Five countries have suffered from this laxness in the EU, apart of course from mistaken domestic policies. As Mervyn King wrote to his Icelandic opposite number in April 2008, explaining that the Bank of England refused to do a swap: “among friends it is sometimes necessary to be clear about what we think.” – Brutal clarity is sometimes needed but the EU failed to behave like a true friend. I began by arguing that Portugal faced an unusually tough economic challenge: low growth, low productivity growth, high unemployment, large fiscal and current account deficits. I then examined various policy choices, from reforms increasing productiv- ity growth, to coordinated decreases in nominal wages, and the use of fiscal policy in this context. I want to end on a more positive note. There is a large scope for productivity increases in Portugal, and a set of reforms which could achieve them. A decrease in nominal wages sounds exotic, but is the same in essence as a successful devaluation. If it can be achieved, it can substantially reduce the unemployment cost of the adjustment. Fiscal policy can also help. While deficits must be reduced, temporary fiscal expansion could be part of an overall package, facilitating the adjustment of wages. The challenge is there. But so are the tools needed to meet it. The first decade of the new millennium – and incidentally the first decade of the euro – is turning into a lost decade for Europe. The European Union, with its new currency, allowed the periphery – earlier with understandably high interest rates – suddenly to bask in low euro rates with the unrestrained banking systems in i.a. Germany and France only too happy to lend. When worst came to the worst, the lenders have (mostly) been spared and the inhabitants punished. No wonder the European Union is losing popularity in all of Europe as fast as the money flows out of Cypriot banks. It is painful to see that in spite of its rich intellectual heritage, Europe is now governed by extremely by narrow-minded policies and no understanding for their social consequences. Now that the financial markets have moved out of Euro crisis mode, at least for the time being, calm reigns again – or as much calm as you are likely to find in that testosterone driven sector. So far, not even a muddled election outcome in Italy has caused much market flurry. However, the Euro debts have not evaporated but with the enchanting words of Governor of the European Central Bank Mario Draghi and a EU banking union in spe debt-ridden Eurozone countries gain time to put its economies in order. This calm allows us to reflect on the wider aspects of the financial crisis on both sides of the Atlantic, such as the contributing role of interest rates in the crisis. Normally, interest rates shot up in good times and sank in bad times but during the last twenty years the rates have more or less been low all the time in the US, the major European economies and, with the birth of the Euro, also in the Eurozone. Things tend to turn into laws of nature when they have been around for a while. The danger is that “chronic” low interests has turned into a law of financial nature, creating quite devilish problems of its own. Let us look at interest rates in the US and the Eurozone. Table 1. US interest rates January 1971-December 1989. Table 2. US interest rates January 1990-March 2013. Table 3. ECB interest rates January 2000-March 2013. 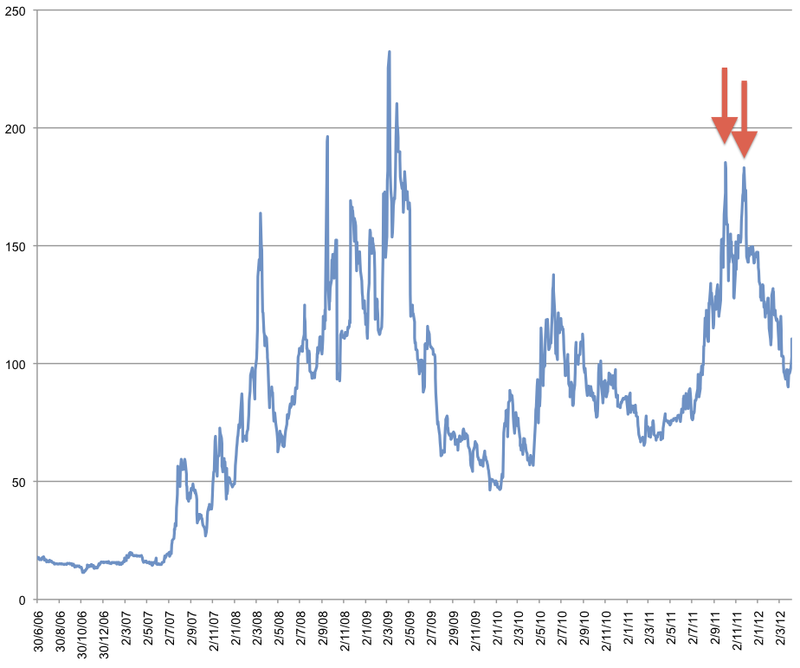 In the US money has been cheap since 1990 and exceedingly cheap since 2000, compared to 1971-1990. The Euro, in existence from 2000, knows nothing but low interest rates. Consequently, funding cost in the developed world has been low. This has affected not only the behaviour in the financial sector but also sovereigns. During the internet bubble of the late 1990s investment bankers, trying to be with it, took off their ties to bond with young dotcom visionaries brimming with bright but unproven ideas. When the tie-less bankers needed to calm their “tied” colleagues, who disbelieved that businesses with no profits in sight could be good investment, they explained that these new businesses were governed by new information age laws beyond the understanding of anyone except the dotcom-initiated. Of course things proved to be less different than it had seemed. And so the new millennium started with the reaffirmation of the old rule that things are only worth as much as someone is willing to pay. Great losses ensued from the new age not being new and from other fallacies. In 1998, the demise of an obscure hedge fund called Long Term Capital Management – two of its board members, Myron S. Scholes and Robert C. Merton, won the Nobel Prize in economics in 1997 – threatened to bring down the US financial system. The New York Federal Reserve quietly organised a $ $3.625bn bailout by the fund’s largest creditors. 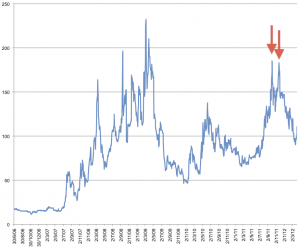 Thus ended a decade with – in historical perspective – low interest rates. But yet lower rates were still to come – and even greater losses, this time not absorbed by creditors but tax-payers. At the time it seemed like a good idea to start the new European currency with low interest rates; in making their decisions European central bankers looked to the US where interest rates had started to fall even before 9/11. The belief in light-touch, or almost no-touch, regulation inherited from the 1990s also took firm hold on both sides of the Atlantic. The first decade of the new millennium was thus marked by historically low interest rates, pared down regulation and hands-off financial supervision. Another new feature was the revolving door between banks and their regulators. This back-and-forth enmeshed banks and their authorities in a spider web of cosy relations and friendships. Money was so cheap that spending it poorly had little consequences. Banking was done like a Jackson Pollock painting: you took a really big canvas and splashed it with colours. It didn’t matter too much if it didn’t make sense – it looked fine in the annual reports written by auditors who knew how to make the balance sheets look good, with tools such as Lehman’s now so infamous Repo 105. When the appalling banking practises of the Icelandic banks were exposed in the Icelandic SIC report in April 2010, not only were widespread suspicions of shady dealing confirmed, but the report showed that what had gone on was much worse than anyone had imagined. Big international banks and auditors from the Big Four were also part of the new Icelandic saga of failed banks and extreme banking. What the SIC report described, under the term “banking,” was in fact a double standard banking: while most clients were treated as any clients in an ordinary bank a small group of clients – the biggest shareholders and their satellites – were lent beyond legal limits, often against weak or no collateral. The financial rational was unclear but the bankers were certainly egged on by cheap money. Iceland has traditionally been a high-inflation high-interest country and when Icelandic bankers suddenly had access to almost unlimited low-interest loans abroad they behaved as if they were at an open bar for the first time in their lives: they binge-borrowed and binge-lent. The last few years have shown that the favours during the boom years were greatly profitable to those who were allowed to binge-borrow. A mercenary army of specialised lawyers and accountants made sure that the cheap money turned into lasting favour. In galaxies of offshore companies debt was skilfully separated from assets. After 2008, one empty shell company after the other has collapsed, leaving behind astronomical debt and hardly any assets. The creditors, not only the failed banks but also pension funds, get next to nothing. For every such bankruptcy it seems likely that previously underlying assets are tucked away offshore. Consequently, the Icelandic tycoons who profited from the binge-borrowing are, almost without exception, so far doing alright in spite of spectacular bankruptcies in companies previously owned by them. Separating debt and assets was not unique to Icelandic tycoons. London remains one of the biggest offshore centres in the world with a large number of offshore specialists. The Irish media are following the gigantic asset struggle as Irish tycoons like Sean Quinn, Patrick McKillen and Derek Quinlan are fighting not to pay their debt to the public bodies that now hold debt from Irish banks, recapitalised by the state. In all debt-ridden Euro-countries the crisis has exposed reckless – and often corrupt – lending that has enriched favoured clients who continue to profit. Lending fuelled by cheap money, made more reckless by securitisation as lenders did not need to fear the consequences of unsustainable lending. During the boom time of cheap money sovereigns like the UK were tempted to fiscal frivolity. Instead of cutting down borrowing, debts expanded. Even in frugal countries like Germany sovereign debt shot up. Cheap money meant there was little pressure on governments to think of necessary but difficult and complicated structural reform, such as labour market reform or competition. In poll after poll, Americans have voiced their preferences: they want low taxes and lots of government services. Magic is required to satisfy both demands simultaneously, and it turned out magic was available, in the form of cheap credit. The federal government borrowed heavily, and so did all other governments — state, local, and municipal — and the American people themselves. Household debt rose from $665 billion in 1974 to $13 trillion today. Over that period, consumption, fueled by cheap credit, went up and stayed up. Pricing risk is now a much-discussed topic in finance. Under-priced risk in lending to countries like Greece is a case in point. Lending will always be seen as less risky in times of low interest rates – and with chronic low interest the risk assessment can be unhealthily affected. The financial sector thrived and expanded with low interest rates and soft regulation. So much so that it became more powerful than the state bodies set to guard it. Certain financial institutions became too big to fail. Instead of punishing creditors it was mainly taxpayers in developed countries like the US and Europe who shouldered the losses of the financial sector. Debt from the private sector migrated effortlessly to the public sector. Now, the link between profit and risk was broken and those who pocketed profits no longer shouldered much risk. There is no change in sight. In the present crisis-doomed atmosphere there are – for obvious reasons – few calls for higher interest rates. Yet, in Japan low interest rates have not solved the problem. All the money printed to sustain the low interest rates should have fuelled inflation but for some reason it has not happened. Maybe we are just postponing another even greater disaster with our low interest rates. I am not arguing low interest rates is the only root to the troubles in the financial sector, that would be overly simplistic. But cheap money should be considered a contributing factor in the present financial misère and its curse takes on many forms. Yes, we need proper structures to rein in the financial sector – splitting apart retail banking and investment banking, firm regulation and supervision, the next set of Basel rules etc – but all these measures with fancy names must do one simple thing: to prevent bankers from administering money as if were worthless. Could Bruno Iksil’s $100bn bet be related to JP Morgan’s own CDS? Sounds like a crazy idea? Kaupthing, advised by Deutsche Bank, organised trades in 2008 to lower its own CDS. Deutsche co-invested in the scheme. JP Morgan’s trader Bruno Iksil is the latest banker to gain unwanted fame for trading astronomical sums. He’s now even famous enough to have nicknames – the London Whale or Voldemort, after the Harry Potter villain. Iksil seems to have been betting investing in corporate CDS, ie Markit CDX IG (Investment Grade) 9 credit index, an index of investment grade corporate CDS, based on 121 (previously 125) big US corporations, financial and others. Iksil works in the bank’s chief investment office, which manages and hedges “the firm’s foreign-exchange, interestrate and other structural risks,” according to the bank’s spokesman, focusing on long-term “structural assets and liabilities.” Iksil has placed such hefty bets, guessed to have reached $100bn, that he seems to be moving the index and that’s been irritating some hedge funds that are affected. Trading in that index surged 61 percent the past three months, according to data from Depository Trust & Clearing Corp. The net amount of wagers on the index, which is tied to the creditworthiness of companies such as Wal-Mart Stores Inc. and now-junk-rated bond insurer MBIA Insurance Corp., soared to almost $145 billion at the end of March from $90 billion three months earlier, according to DTCC, which runs a central registry for credit-default swaps and reports weekly aggregate volumes. Perhaps the hedgies have been muttering to Bloomberg, first out with the story April 5, just because Iksil is affecting their positions. More pondering, info and graphs re Iksil’s trades on the wonderfully informative FT Alphaville. And there is speculation if this type of trades will become part of financial history when the Volcker rules come to rule, in July. Iksil seems to be doing all of this not as a rogue trader but with the blessing from JP Morgan’s commanding heights. Maybe this is a clever long-time hedge. Perhaps perhaps… At least, the management doesn’t seem to mind Iksil risking/investing $100bn moving the market. The most recent peaks, indicated by the arrows, are Oct. 4 and Nov. 25 2011. From the beginning of this year the JP Morgan CDS has been steadily falling, as the graph shows. Interestingly, it has fallen in the last three months, when the trades in the CDS index has surged, apparently due to Iksil’s diligence. As pointed out earlier: possible just a freak development. Other forces than Voldemort’s might certainly be at large. But can anyone be so hubristic/daring/foolhardy/foolish to manually influence its own CDS? Well, the know-how to influence one’s own CDS has been out there for a while. In the summer of 2008 Kaupthing was suffering from murderously high CDS – the management felt it was all horribly unjust since the bank was, according to the key figures, doing incredibly well. The interesting tail to both to the Kaupthing and Iksil trades would be to know who is on the other end. In Kaupthing’s case we don’t know but whoever it was did very very well. Kaupthing did meet its end in October 2008 – bankrupt, as happens when the wrong decisions are taken over some time. JP Morgan can happily bet in whatever crazy way. Its management has tried and tested the ground – so far, a bank like JP Morgan won’t have to face the results of bad/insane decisions and hubris. Will banks be able to bank on that forever? *Deutsche’s plan is outlined in the SIC report, chapter 7.3.6.3 (only in Icelandic). : Deutsche put up a loan of €125m and harvested handsomely: it got a fee of €5m for the package. In June 2010 Reuters reported that the Serious Fraud Office was investigating this scheme but nothing has been heard of it since. More here from Icelog on the scheme and those involved in it, ia Kevin Stanford and Karen Millen.